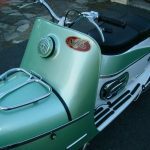 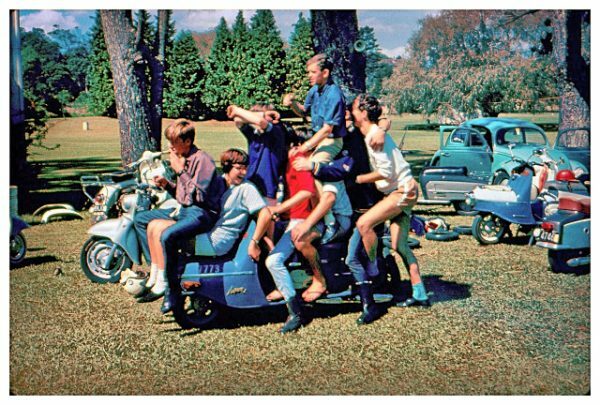 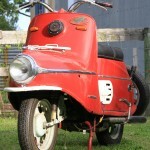 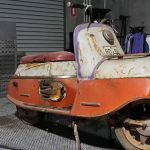 Recently we rode our Vespa scooters from Wellington to New Plymouth where we caught up with Blair. 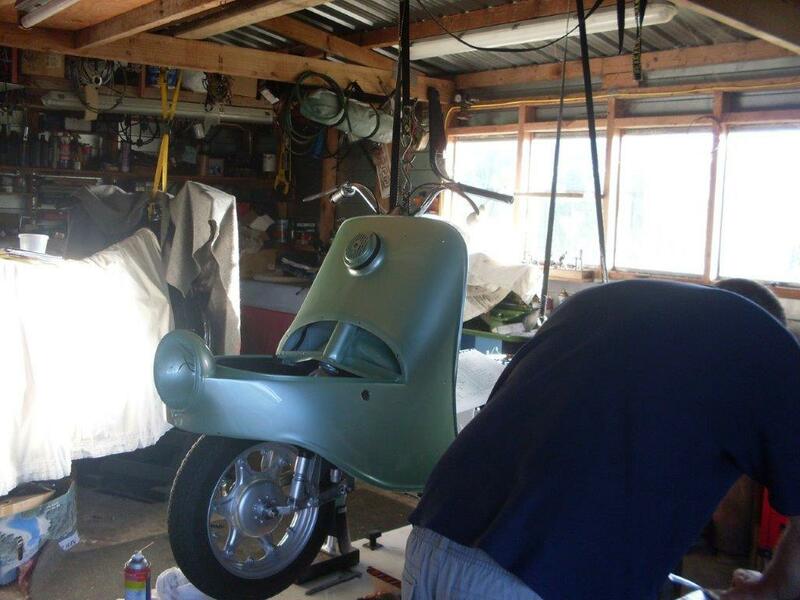 He showed us his restored 502, progress on the J-Zeta 350 and other projects he had on the go, in his shed. 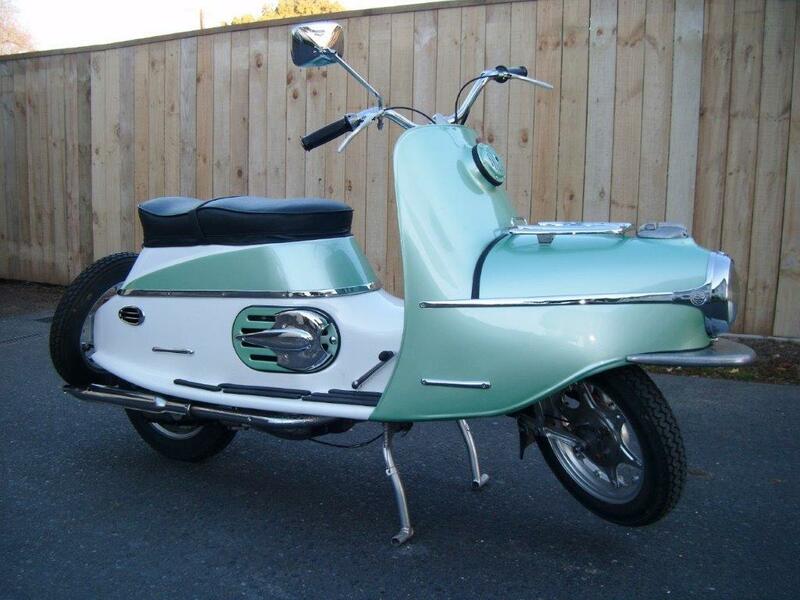 The 502 looked great in the pictures posted to the site and was restored to a very high standard. 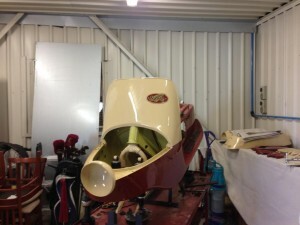 Blair had painted it and done most of the panel, electrical and engine work himself. 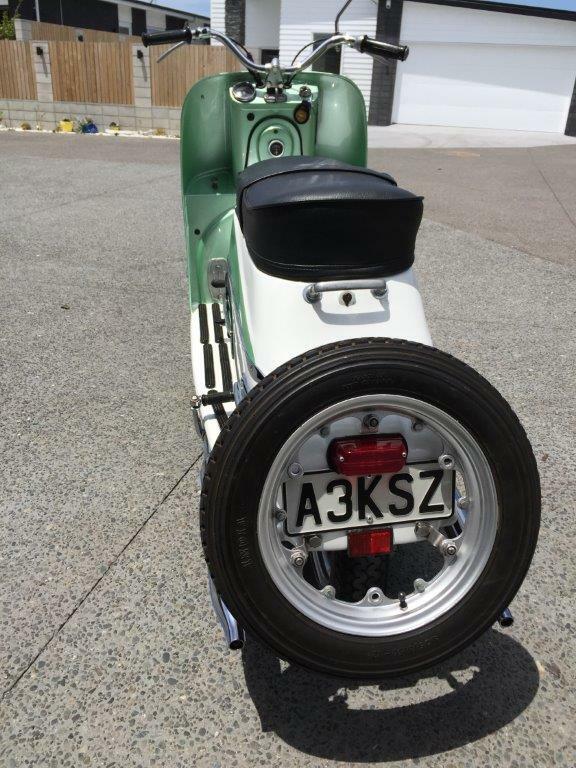 Thornton, another NZeta.com member and 502 owner, was lucky enough to take it for a quick ride up the street. 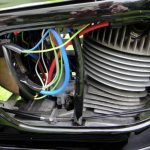 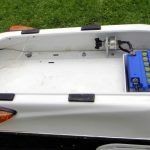 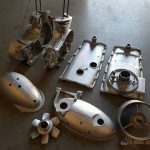 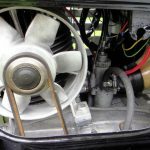 Like a lot of 2 stroke engines they can flood easily when starting them and if the battery level is down, the electric start won’t turn the engine over enough, to fire it up. 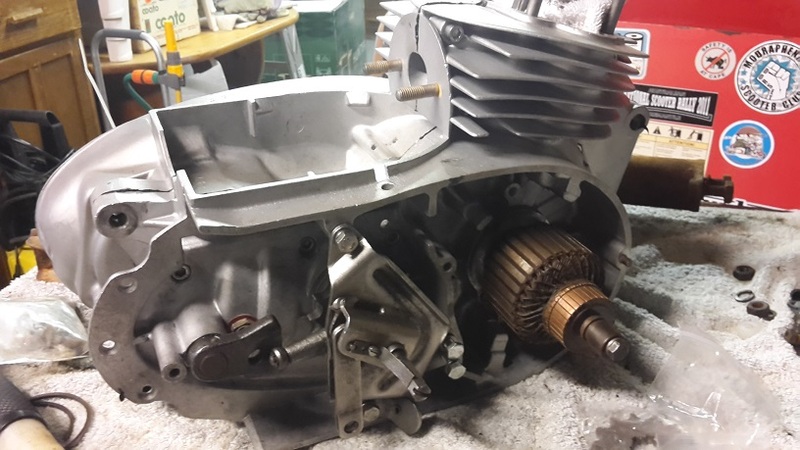 When running, it idled nicely and was fairly quiet. 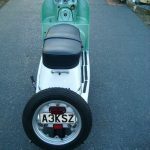 It had the larger single muffler and a reconditioned standard motor, bored to 1st oversize, which provided a good spread of power. 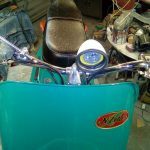 The LCD auxilary light is a good idea as the factory headlight has some limitations. 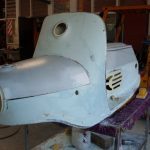 Utilising local knowledge and people has been key for Blair to complete the 502 to such a high standard and like all of us, there just isn’t enough time to complete those projects with work and family commitments. 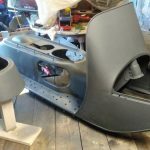 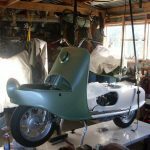 The J-Zeta (A Jawa 350cc engined NZeta) project when completed, should be an absolute stonker, if what he has done so far is anything to go by. 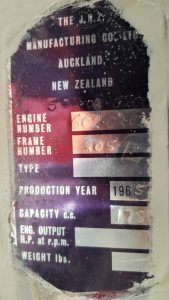 A piece of New Zealand history. 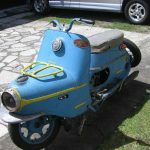 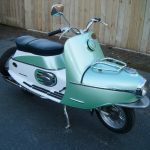 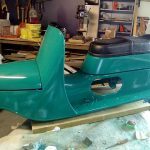 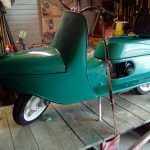 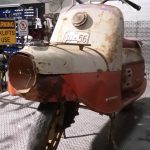 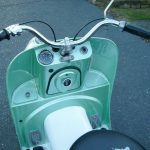 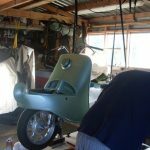 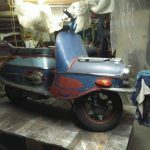 Restored NZETA scooter with a bit of history. 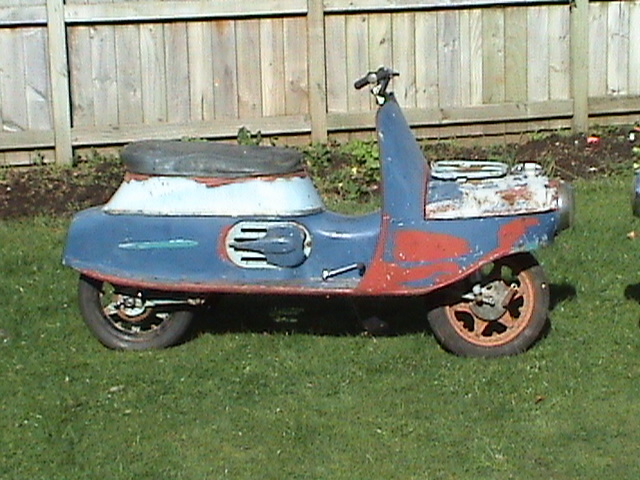 Used as a workshop runabout for a few years then sat in a shed from around 1980 until 2008. 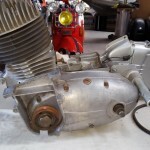 Restoration started 2008 and finished in 2012. 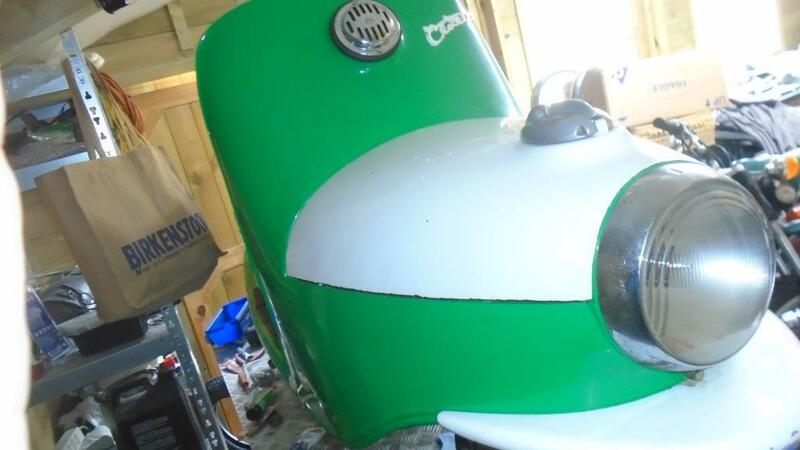 Has done approx 1500 Miles since full restoration. 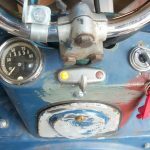 (Speedo in miles not kms). 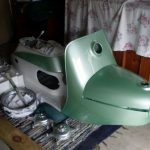 Lots of new parts fitted and all chrome work redone. 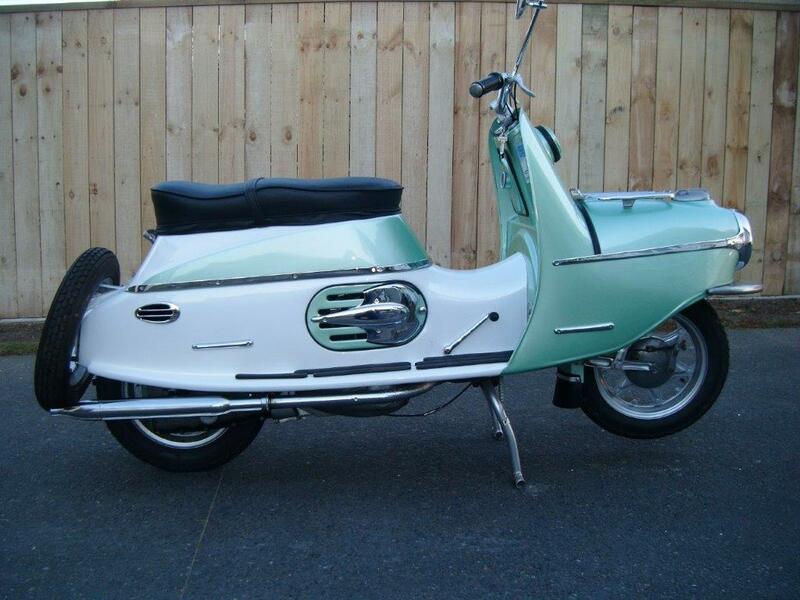 Has performed well since restoration and now has a few blemishes and chips in the paintwork. 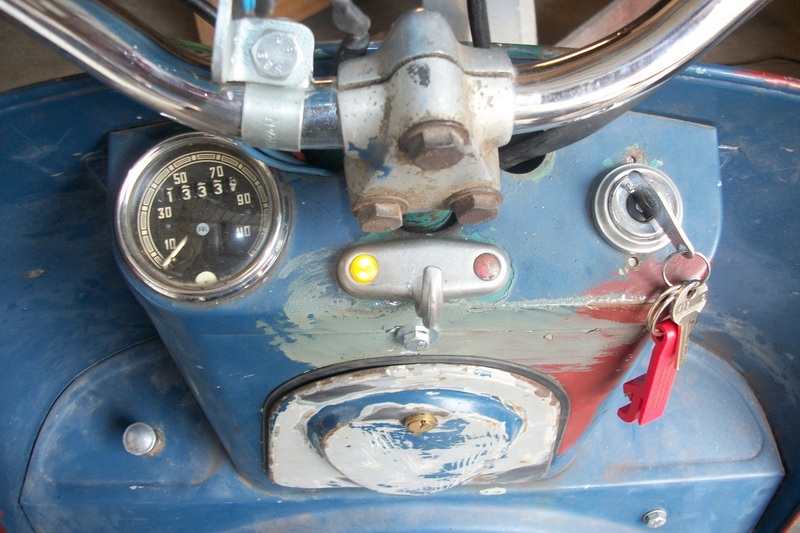 Look around the front headlamp, rear brake lever and the rear handle. 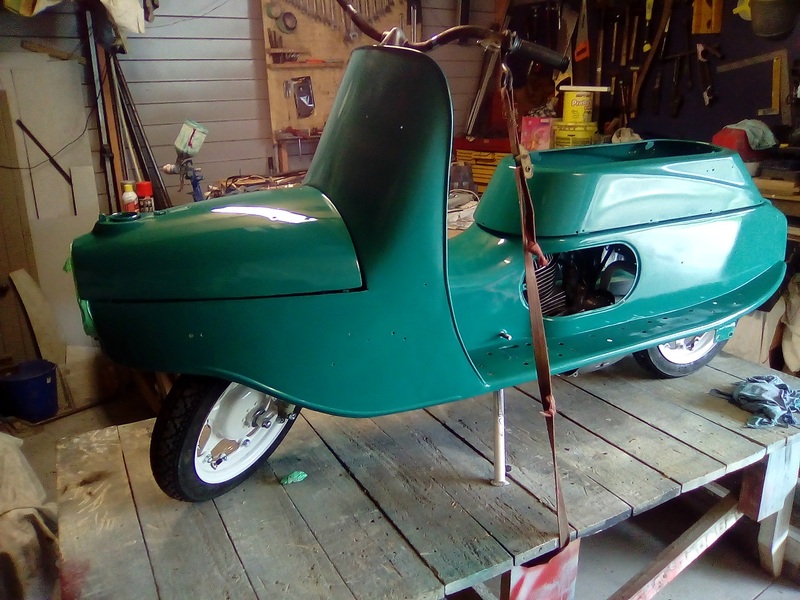 Converted to 12 volt and has the original electric starter. 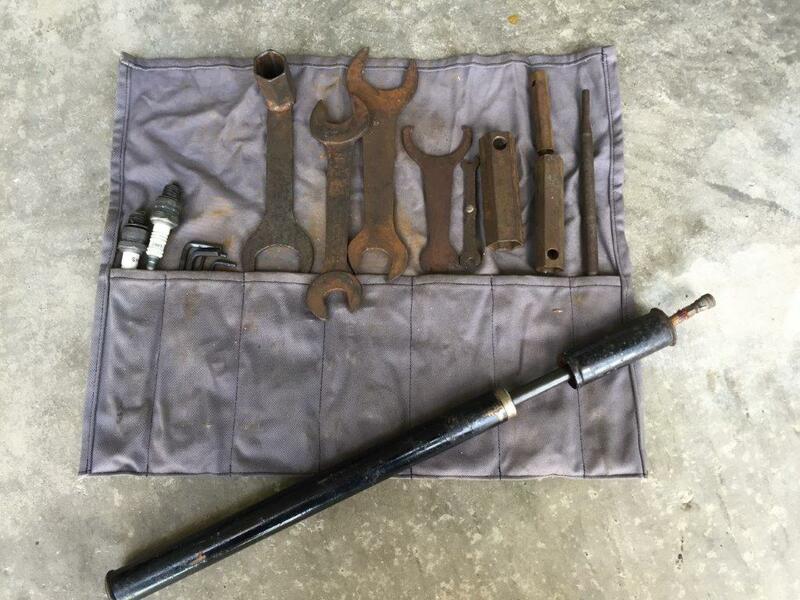 Comes with the original tool kit, pump and owner’s manual. 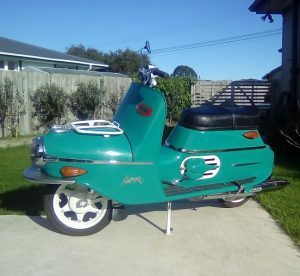 Has even done a ride to the Cold Kiwi. 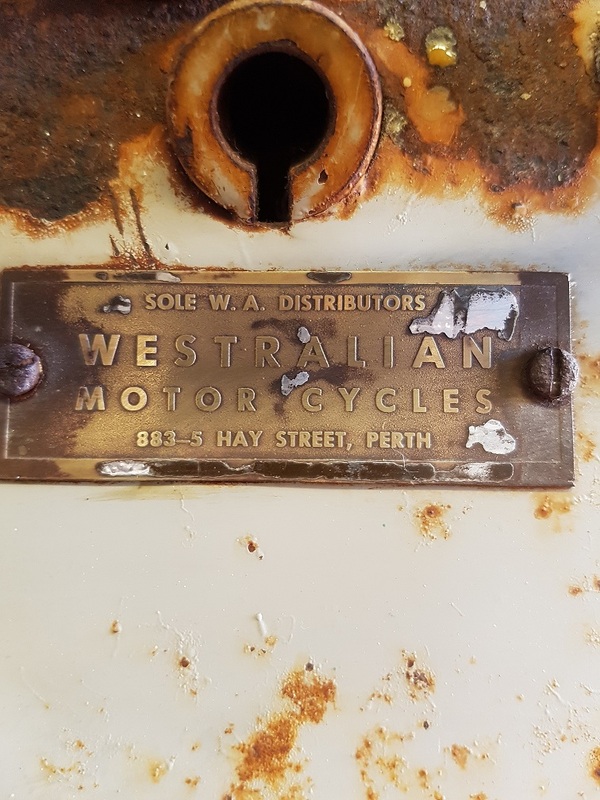 I have the original number plate which could be put back on as a personal plate if required. 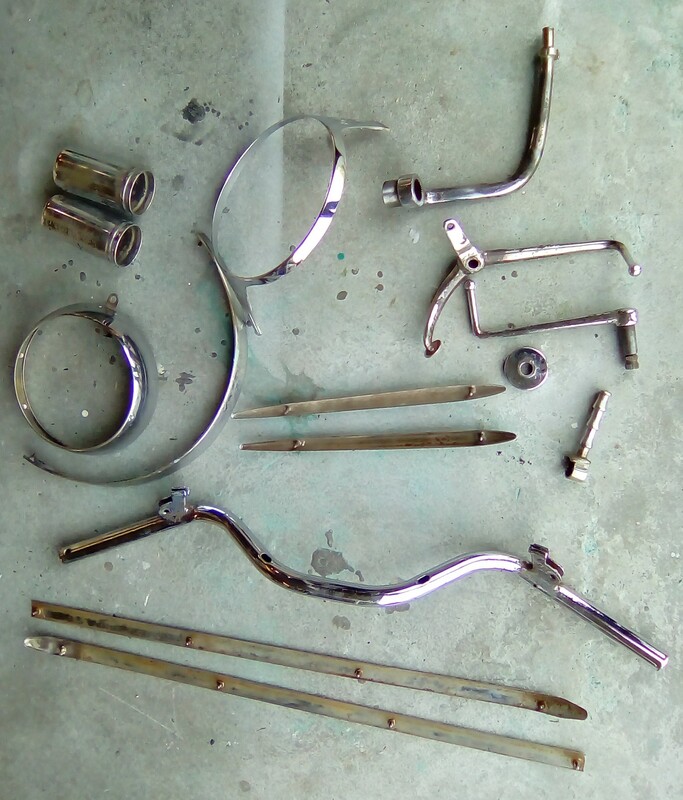 Also have some spare parts that will go with the bike. 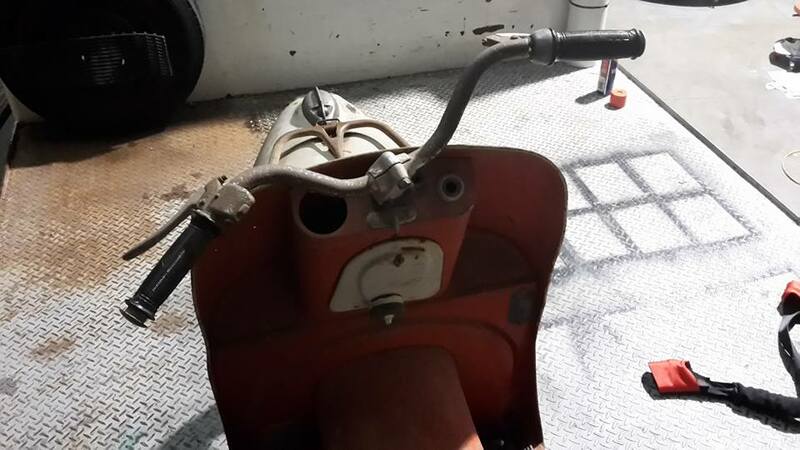 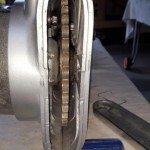 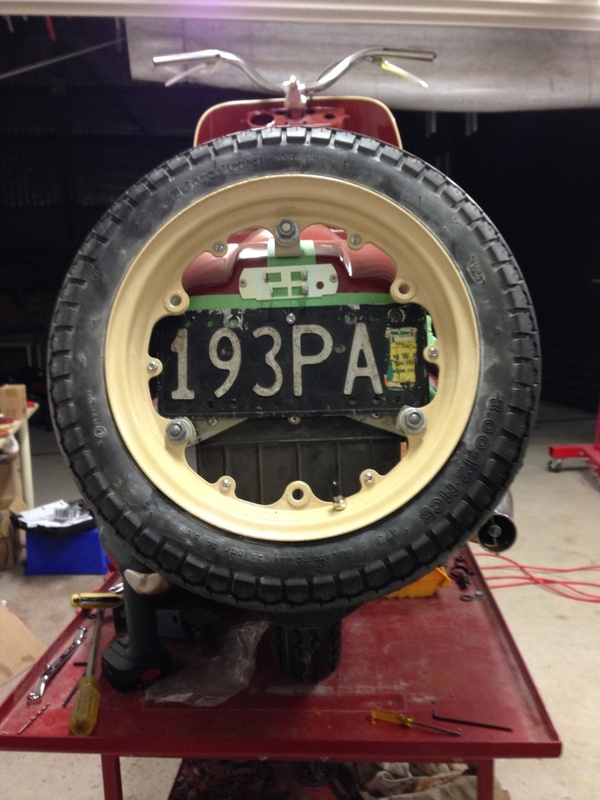 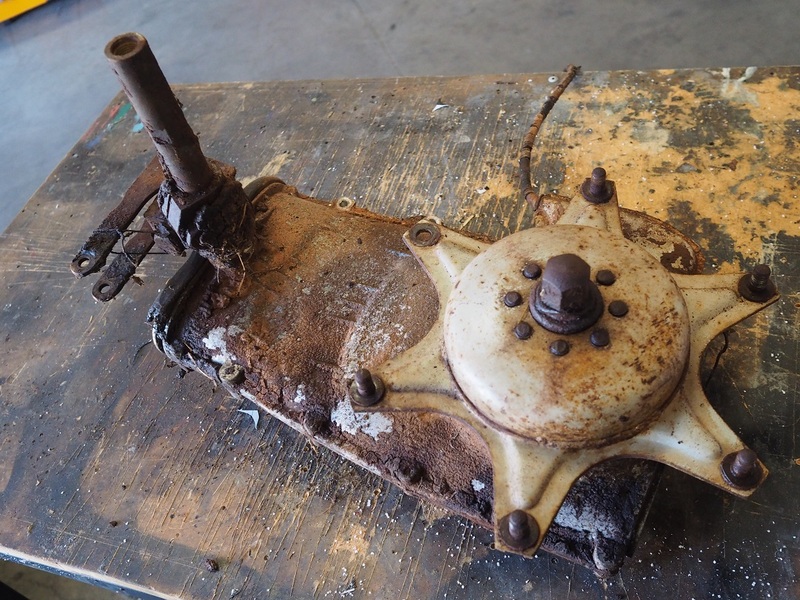 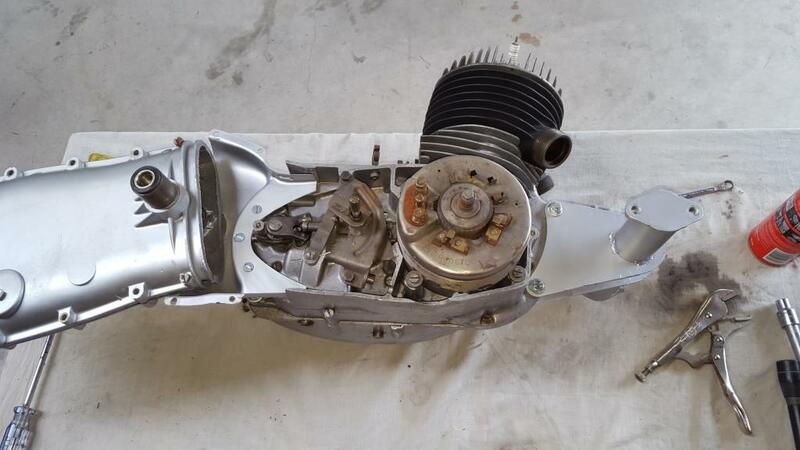 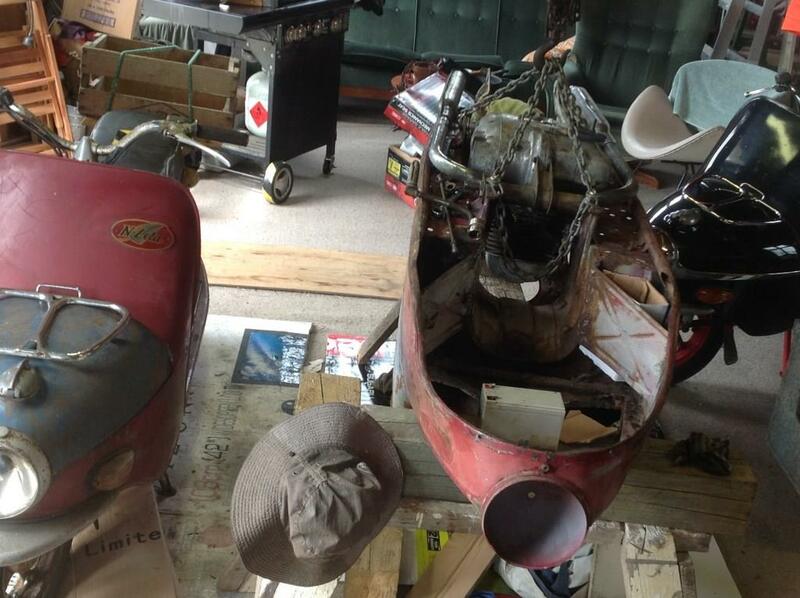 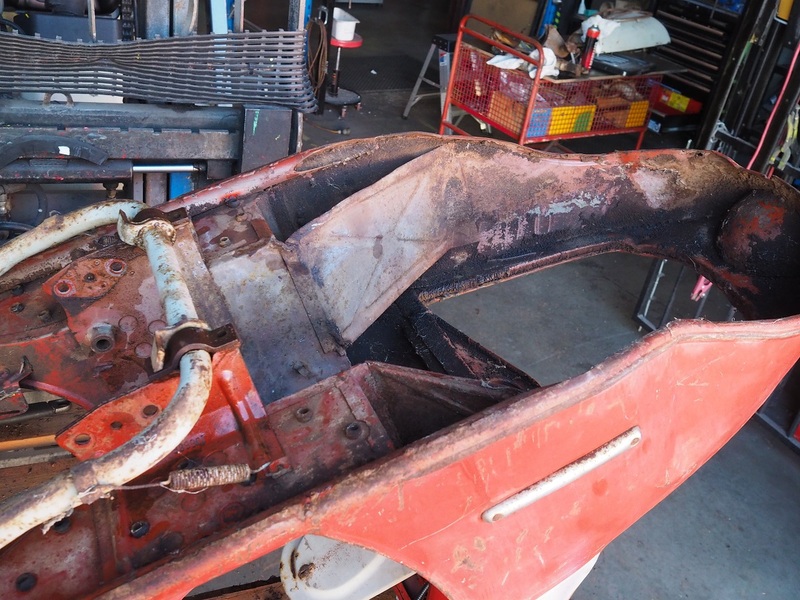 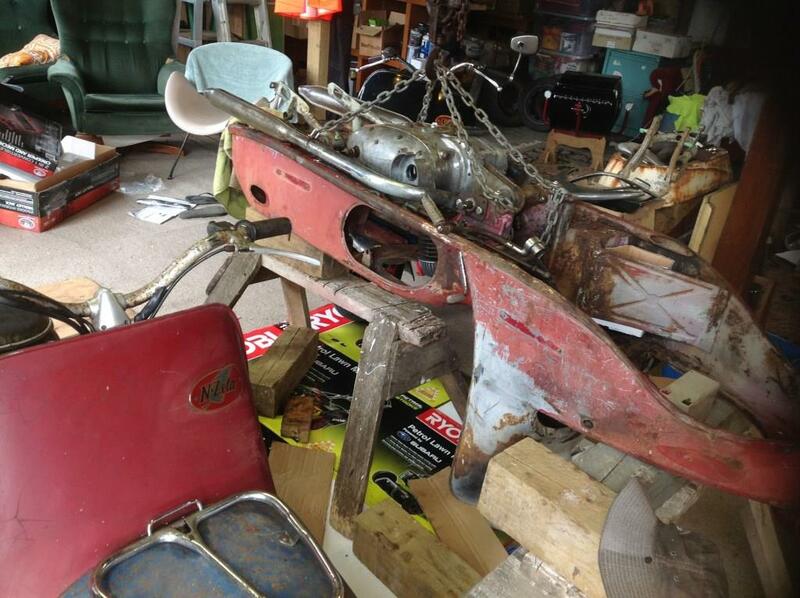 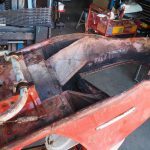 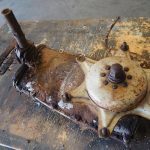 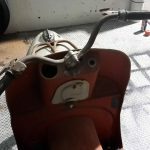 Scotty recently sold his NZeta 501 for $10K, so lets get building / restoring out there! 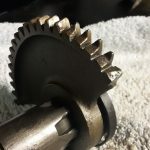 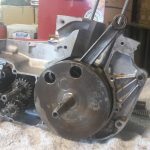 Blair recently sent me some more pictures of his J-Zeta 350 project and provided some good information for anyone looking at doing this or having to rebuild the front of a 501/502. 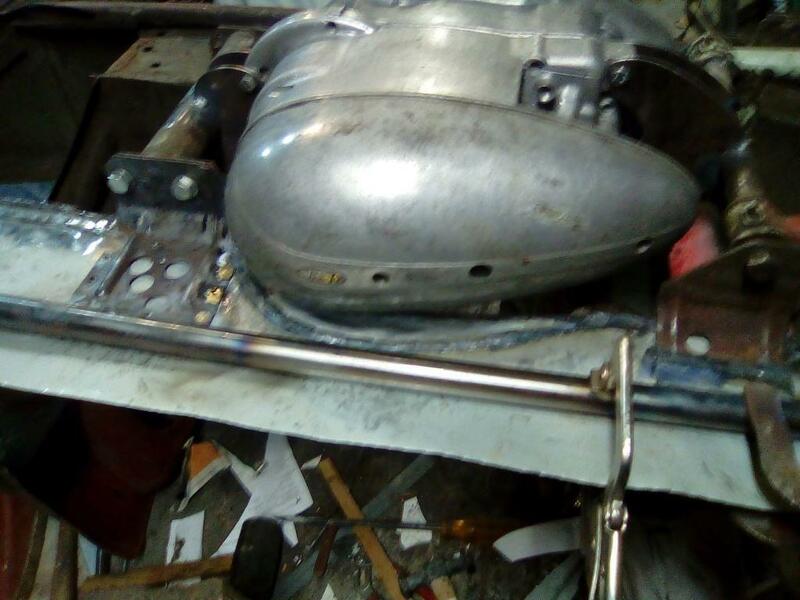 There is nothing too major done as yet really, but at least I have got the engine to fit pretty well and the new foot board and it’s frame tube completed. Just doing the front now and have to make a tool for the swaging along the edge of the front panels / mudguard. 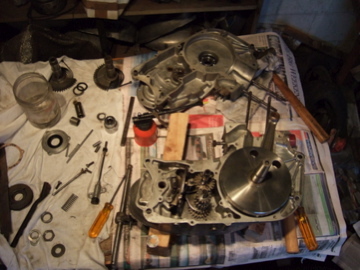 I have to get the pistons, conrods, kick start gears before taking the engine to Ken Page over in Taupo. 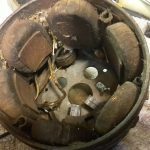 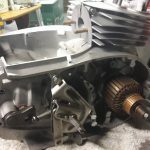 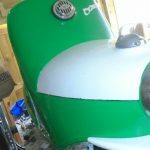 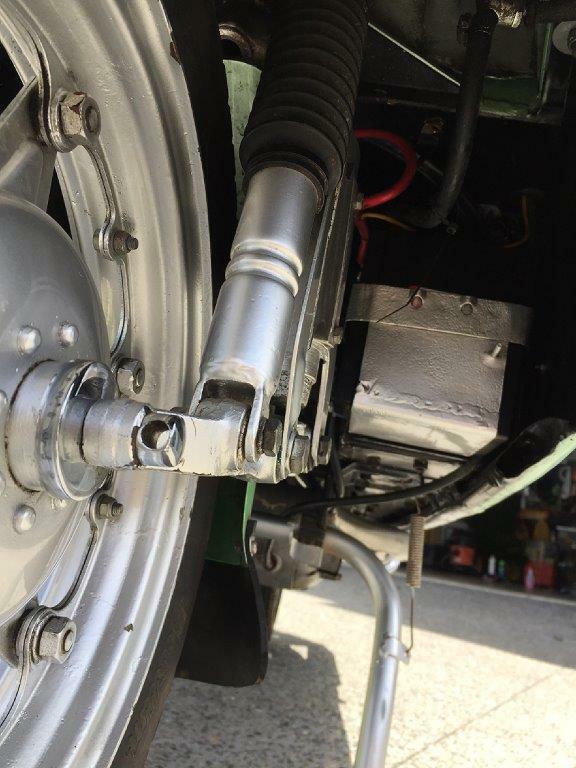 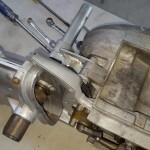 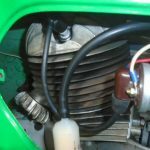 He races Jawa 250 and 350’s in the post classic motorcycle racing scene and is the man to see for reinforced gear selectors and extra oil holes, amongst a couple of other fixes for weak spots. 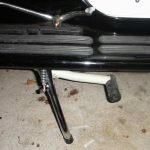 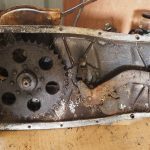 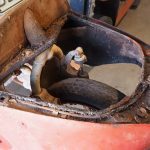 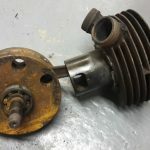 I’ve sort of followed the instructions for the 350 J-Zeta modification, on the Scooter Stuff page, but not for the front engine mount. The pictures are not the best but you get the idea. 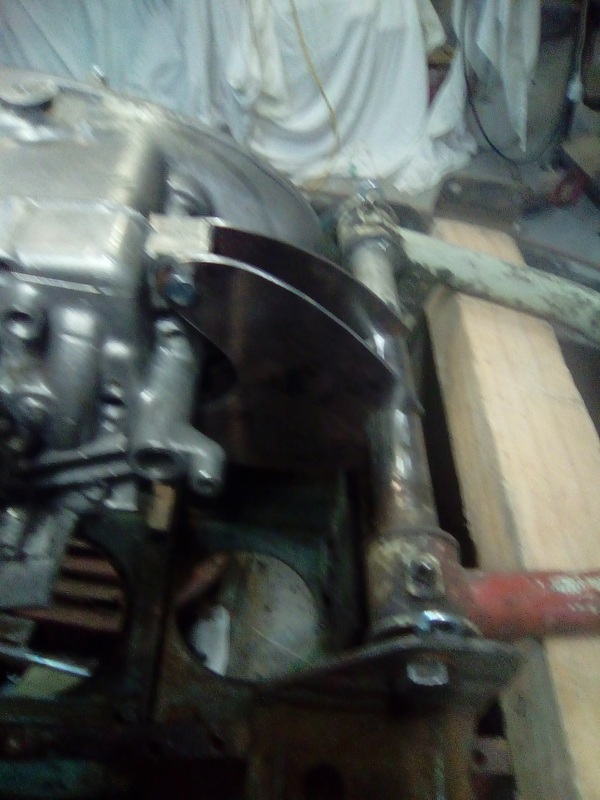 The engine mounts are just tack welded at the moment and I need to get the wheels on and the chain run to be sure they are in right position. 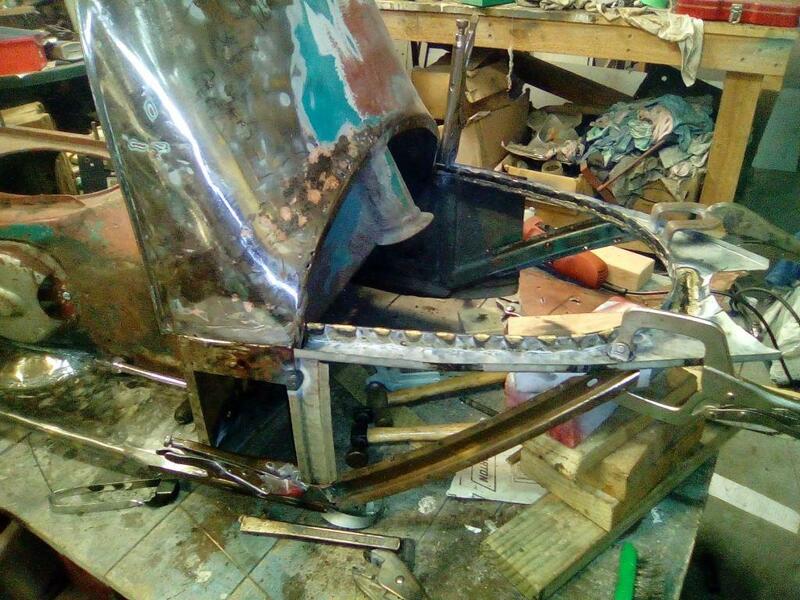 More progress has been made in the last couple of days and I have finished one main front panel. 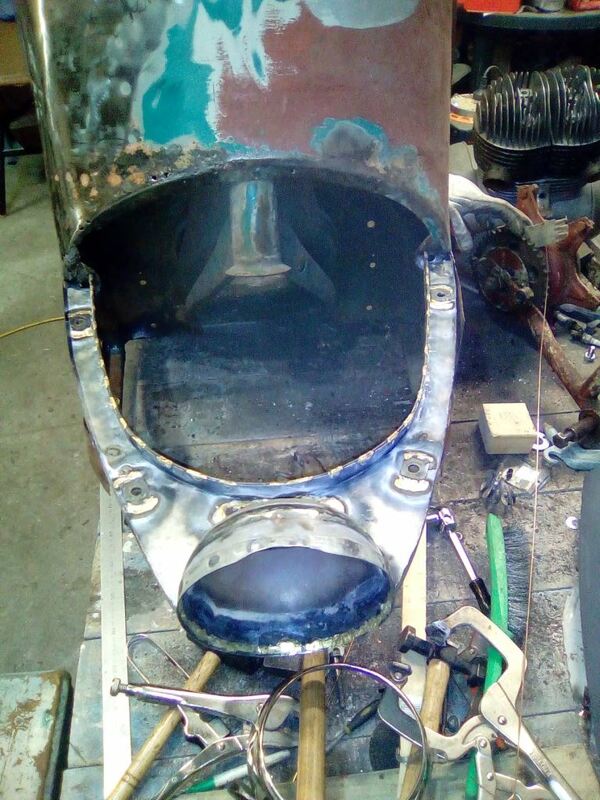 Just started the other side, but am only replacing half of that panel so it will be easier. 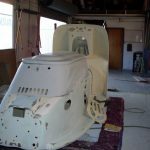 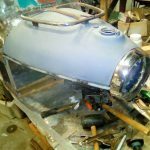 I used the old front frame part under the tank, that goes from leg shield to headlight and loops around, as a template to make another. 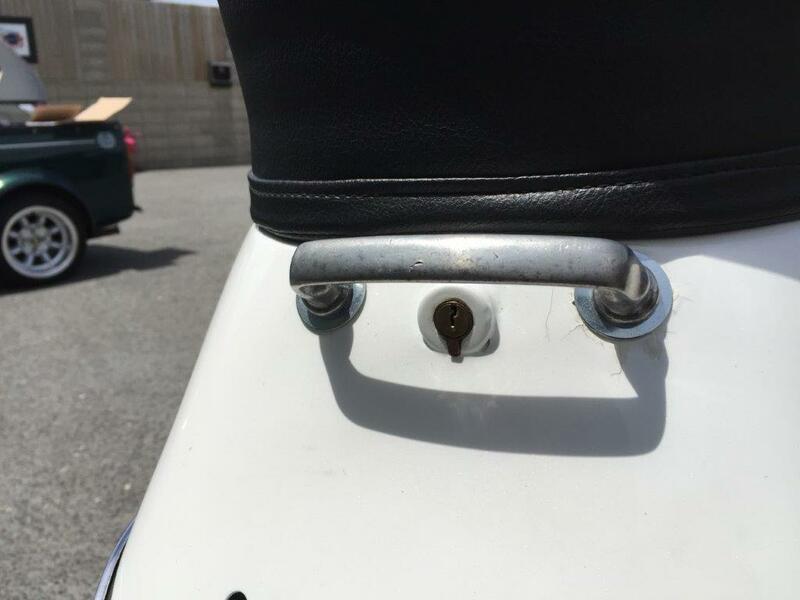 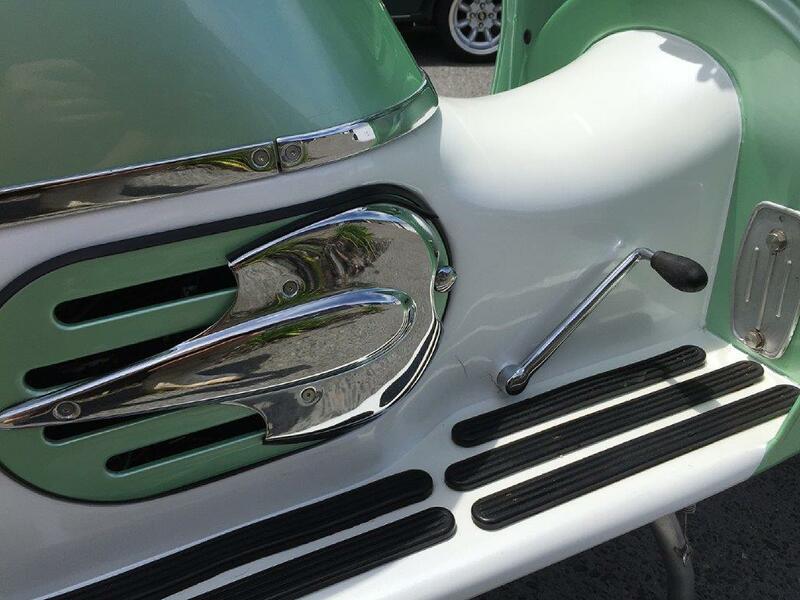 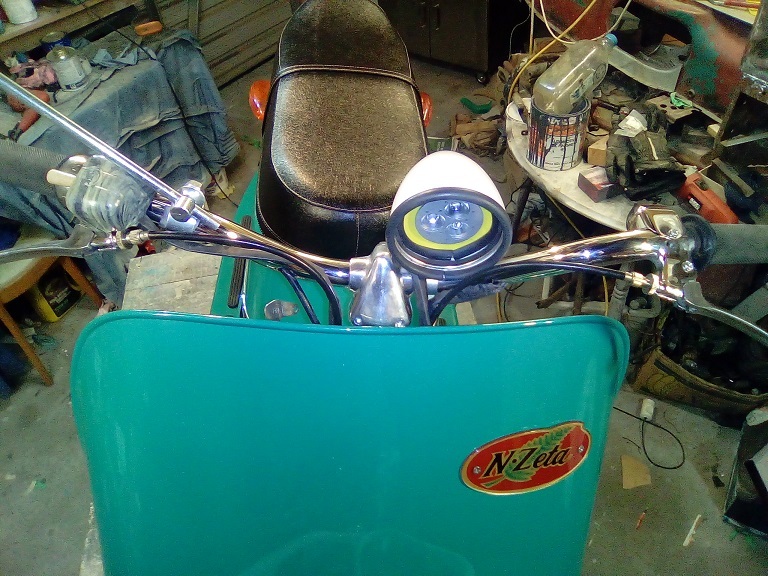 I used the same panel steel as the whole scoot is made from, which is 20 gauge or .75 mm. 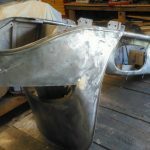 Use the base of the tank as the shape to make the new front loop but just slightly bigger than the tank, to allow for the curve from tank down to the front panels. 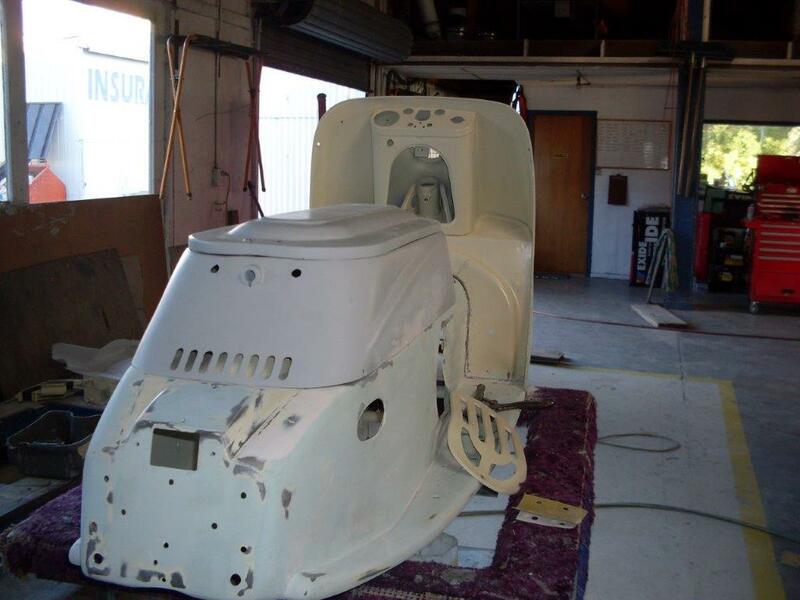 That way the tank base edge and top of front panels, where they meet will be a smooth curve and not stepping out to the front panels. 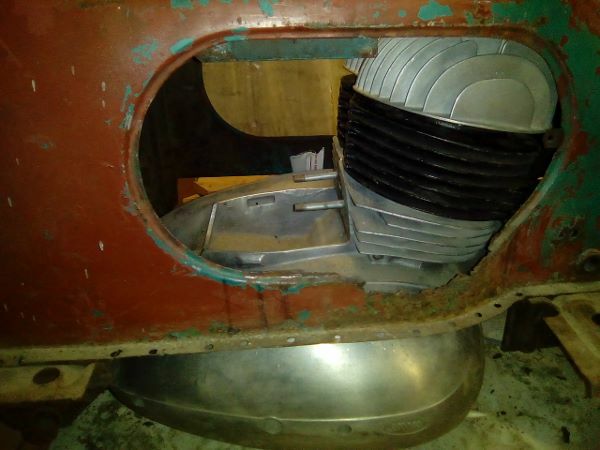 The tank has to fit it well, so I think best to start with the tank base shape. 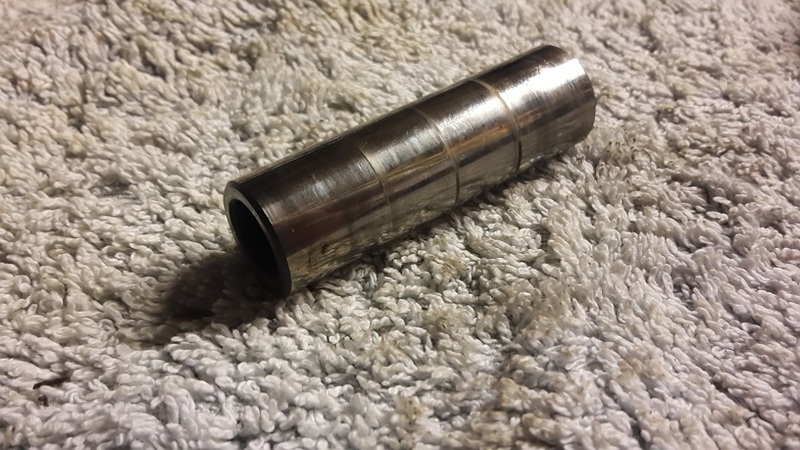 However, because I do not have benders, I made it from 2 pieces and the front loop is reinforced with 3 mm think 12 mm flat bar. 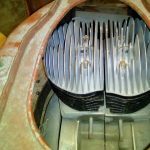 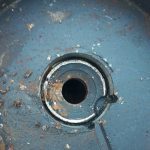 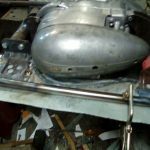 The tank I am using is the top off one tank, and the bottom of another, then welded together as the original was made (edges welded over). 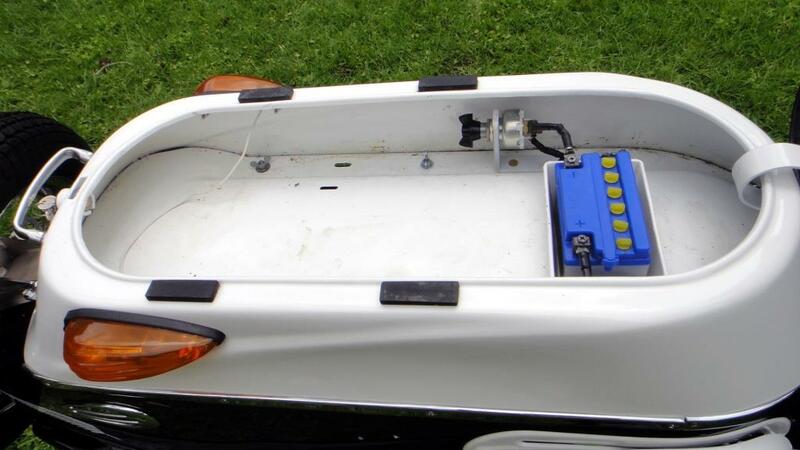 The only issue with this is, it makes the tank a few mm narrower, so I constructed the front loop to suit my tank. 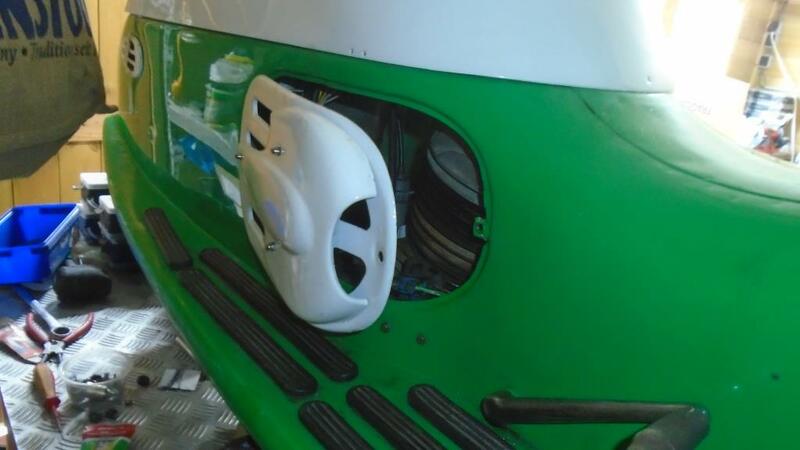 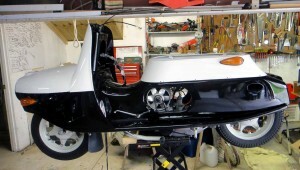 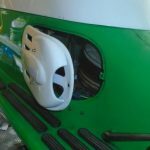 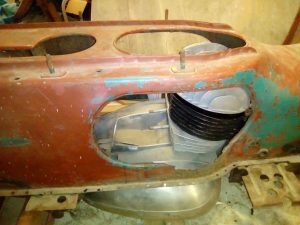 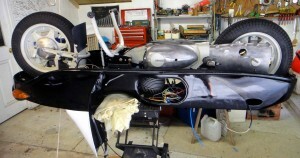 The tank fits more flush onto the front body panels as they bend around to the headlight. 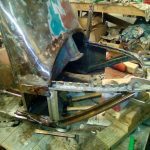 I only use Oxy/Acetylene welding, as that is all I have but as this steel is so thin, I brazed it all together. 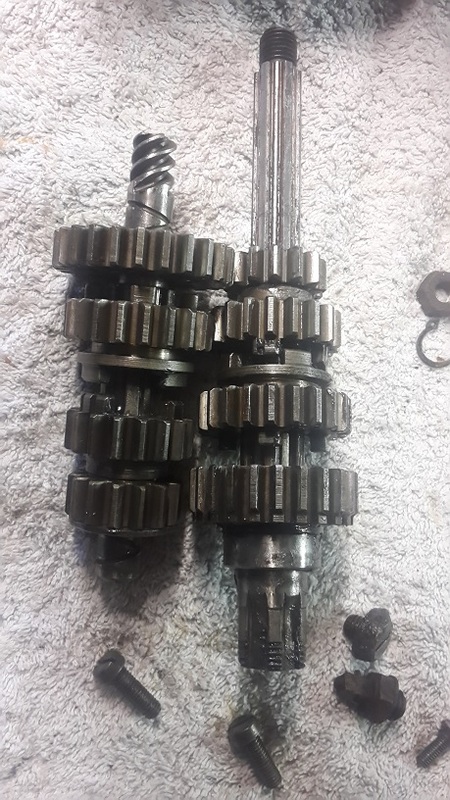 That saved a heap of warpage and made it doable really. 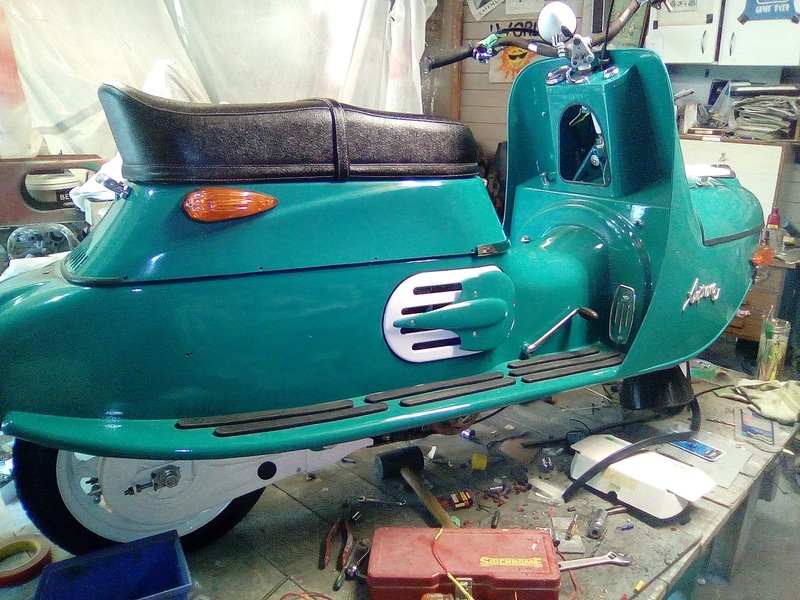 I did make a whole lot of templates from paper and cardboard, but as I have modified that front loop, I had to tailor make the side front panels. 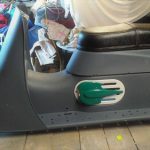 I do have foot board templates, both in metal and paper, and have done 2 RHS footboards now. Making the headlight cup was a major experiment. 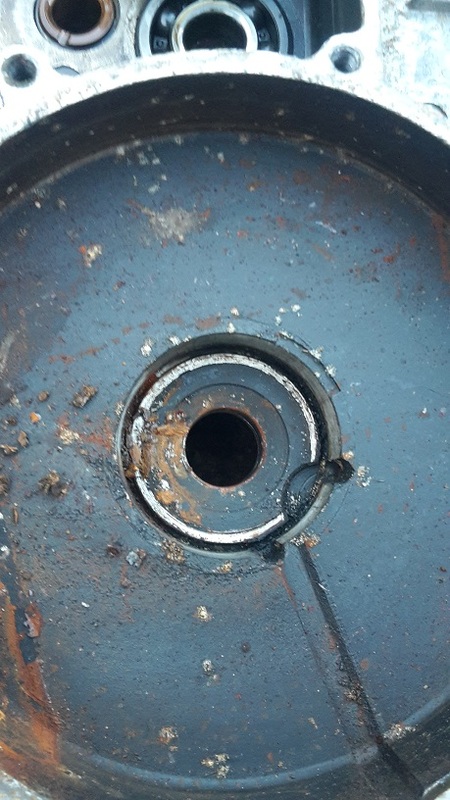 I used half an old tank cup, and made the rest of the cup from 2 pieces of panel steel. 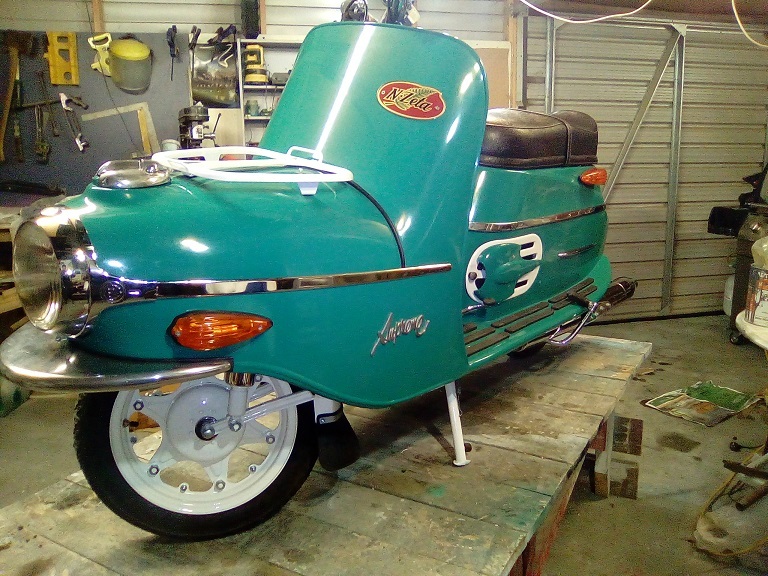 It is far from perfect, but is round-ish, fits nicely and the tank will cover it anyway. 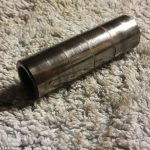 This was the hardest thing for an amateur to make. 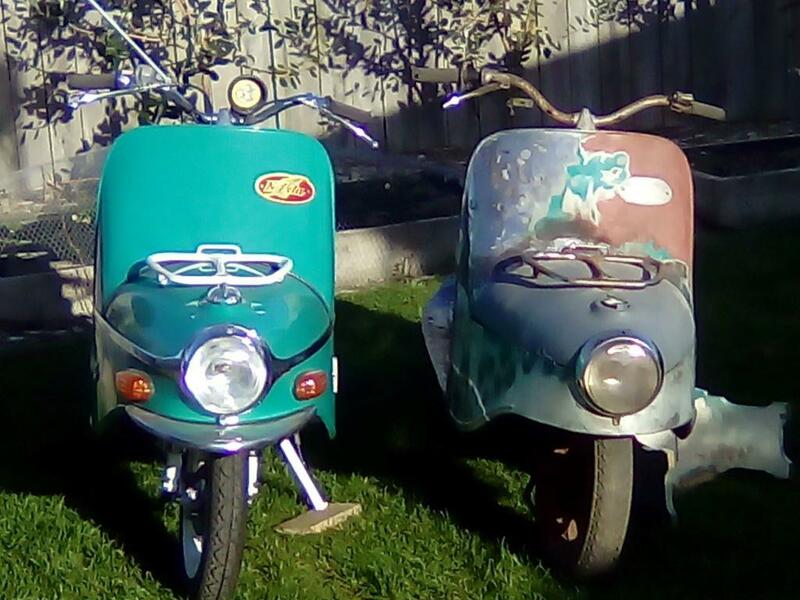 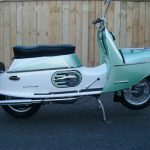 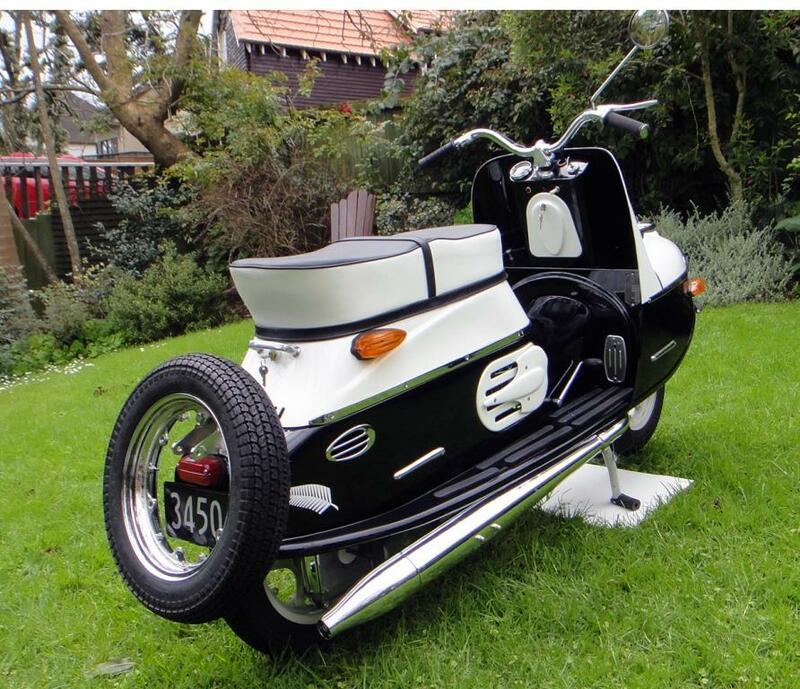 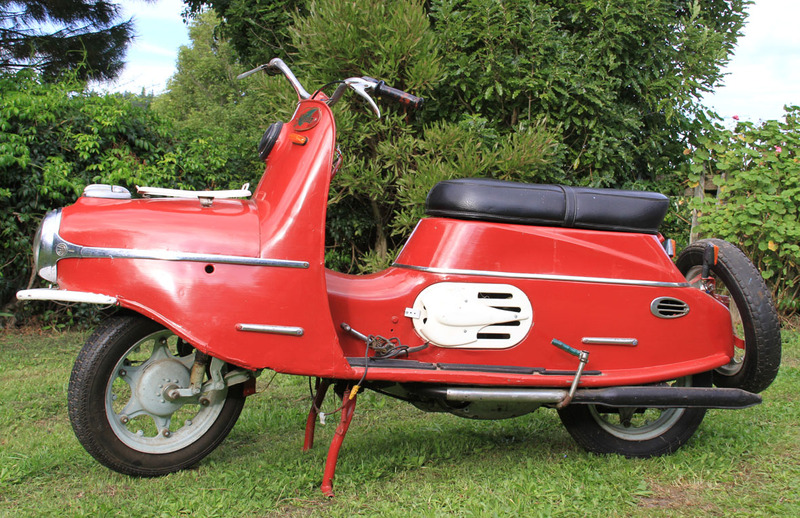 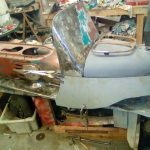 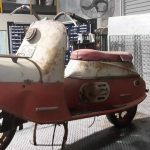 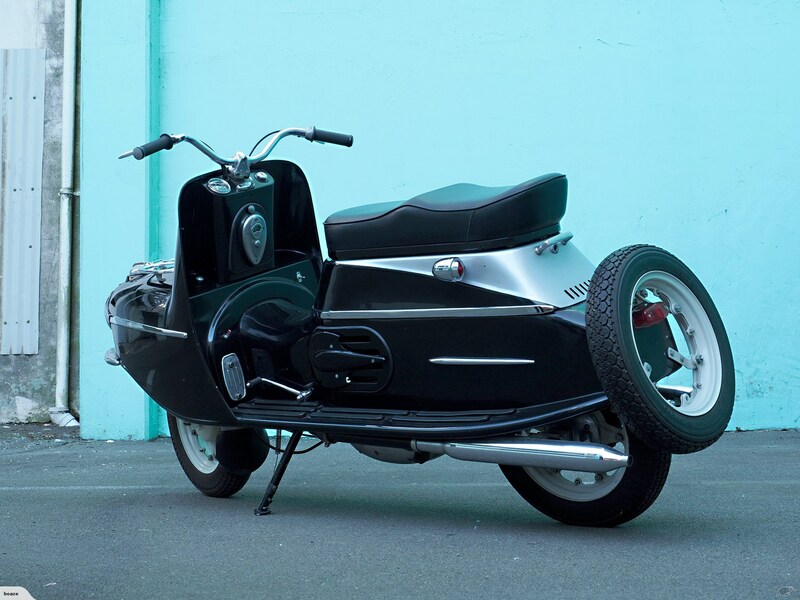 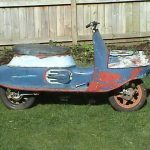 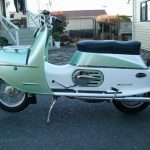 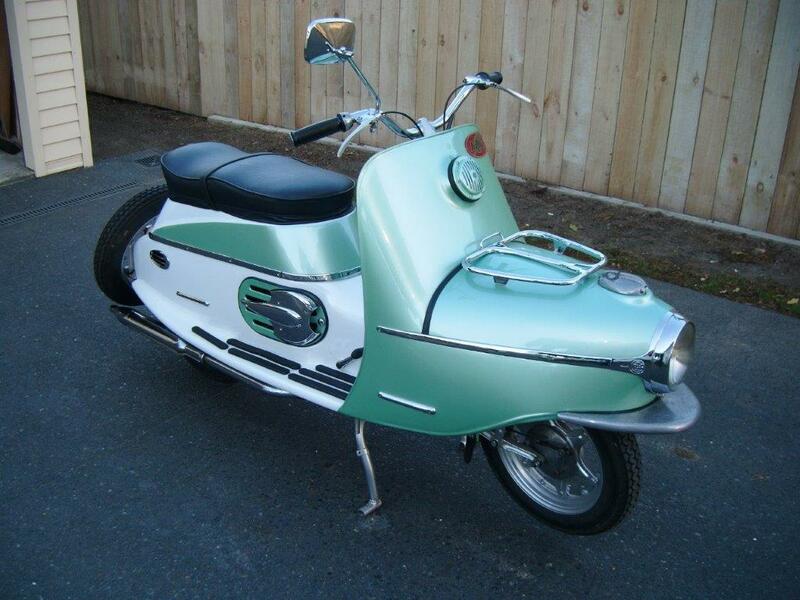 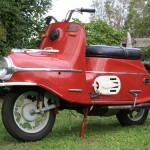 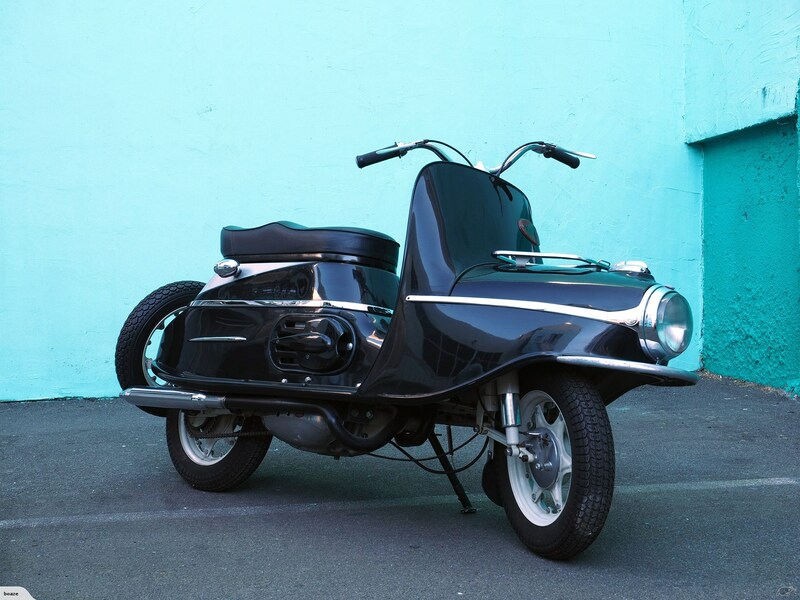 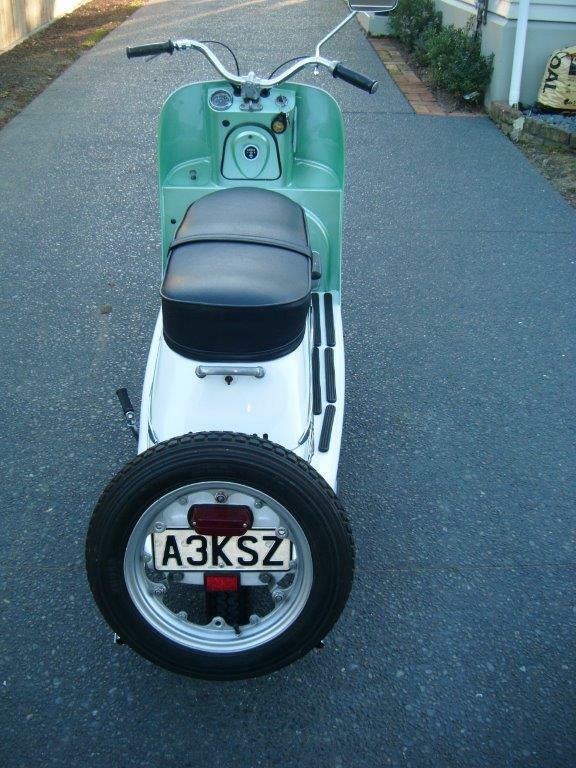 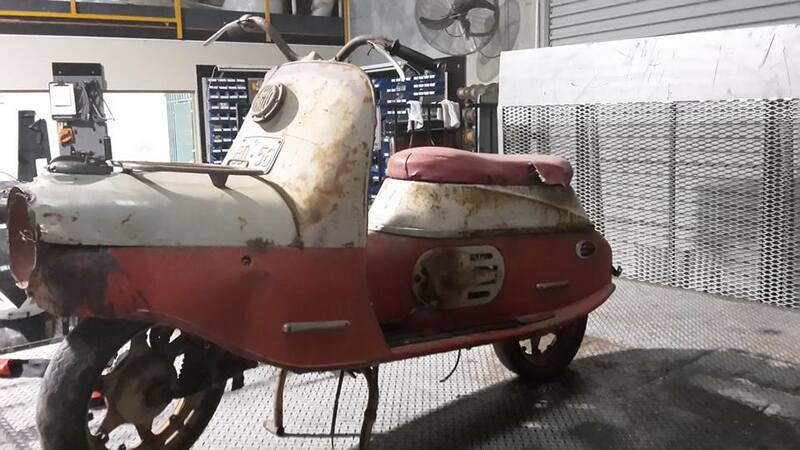 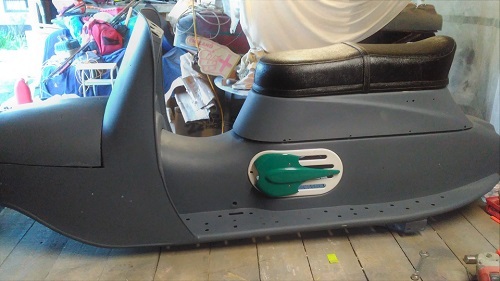 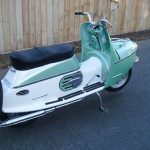 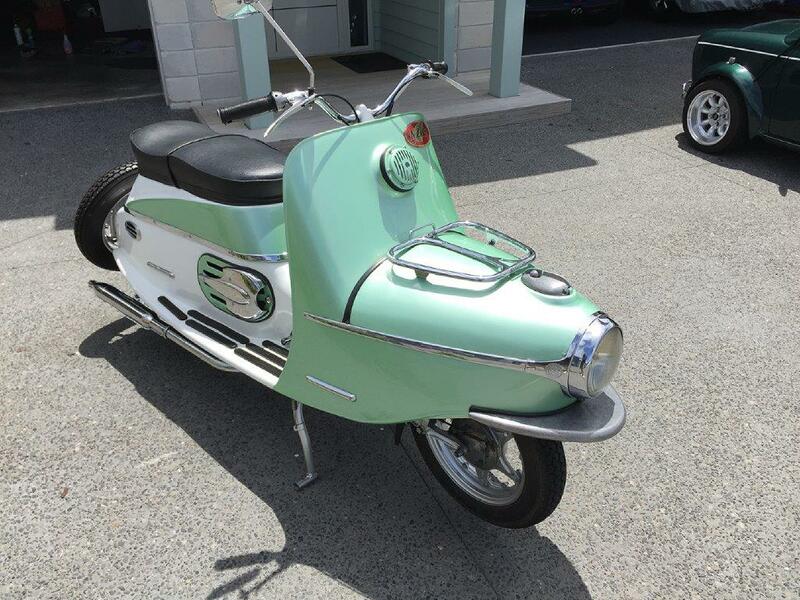 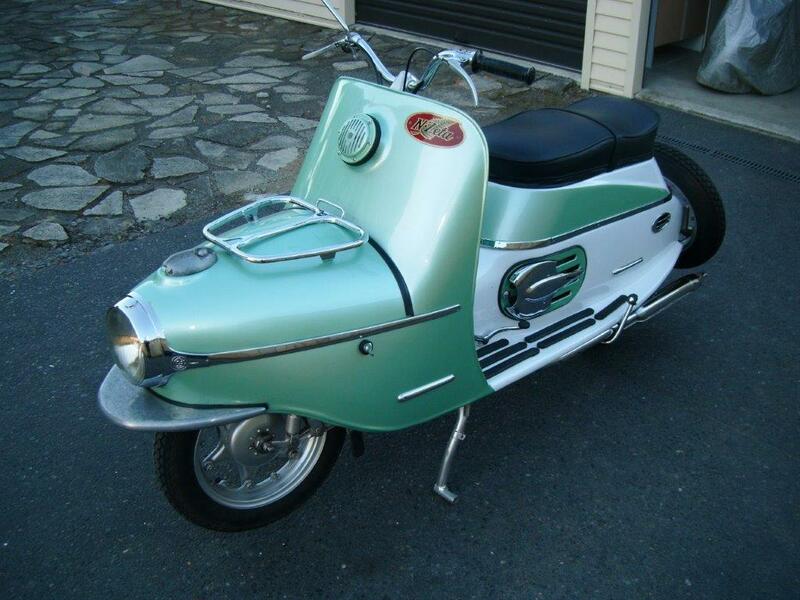 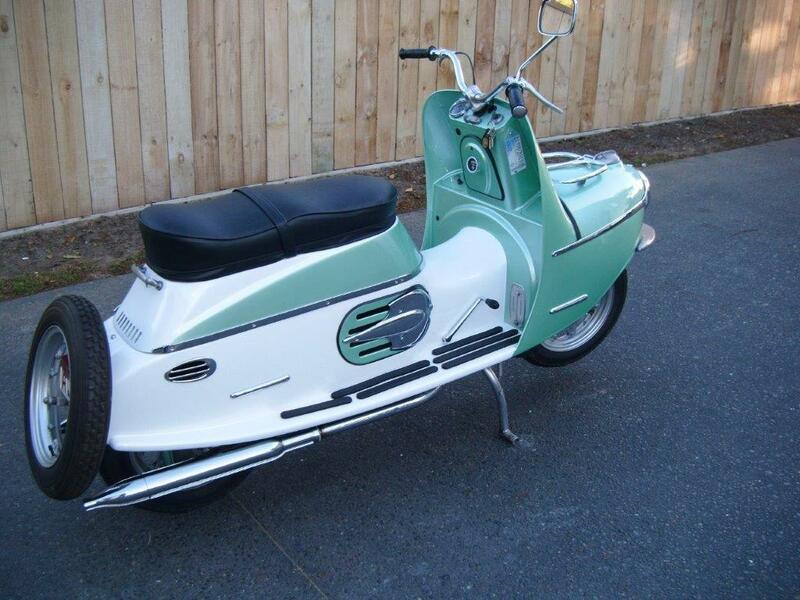 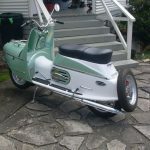 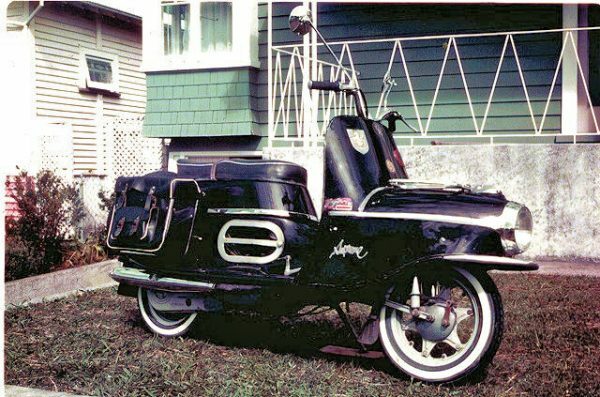 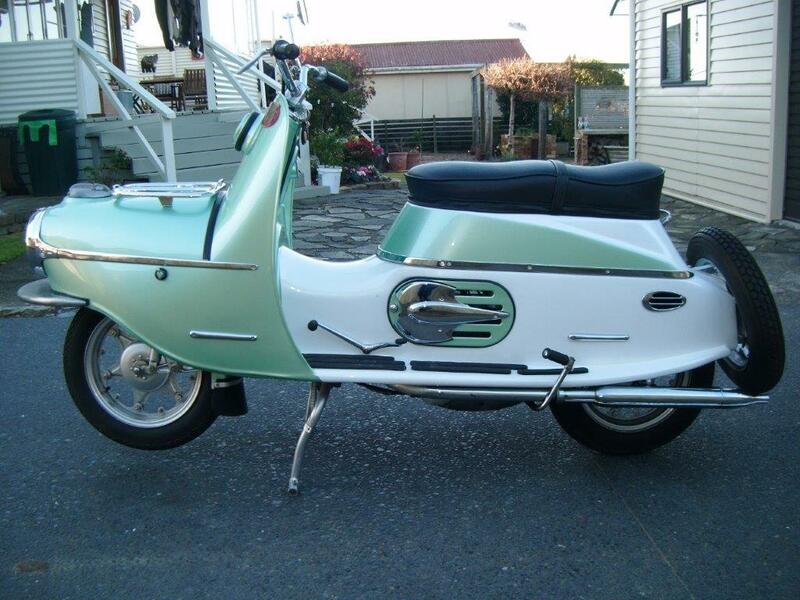 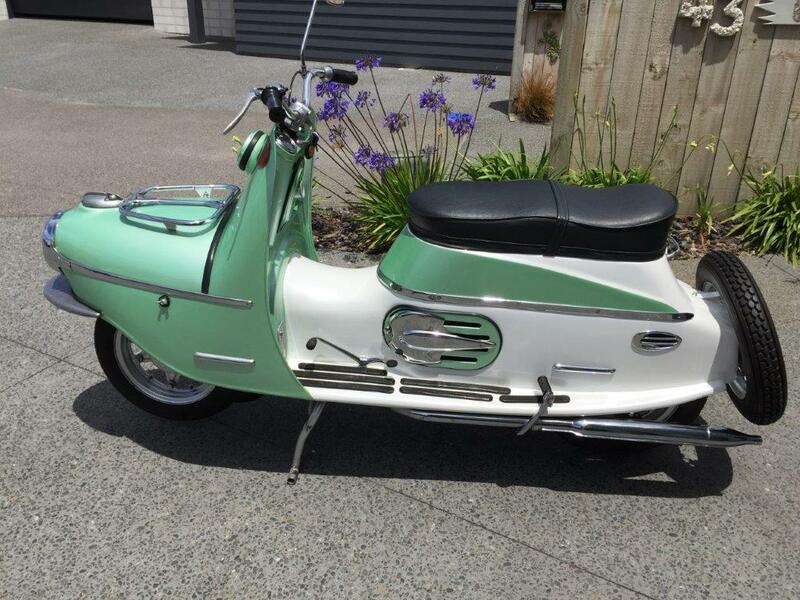 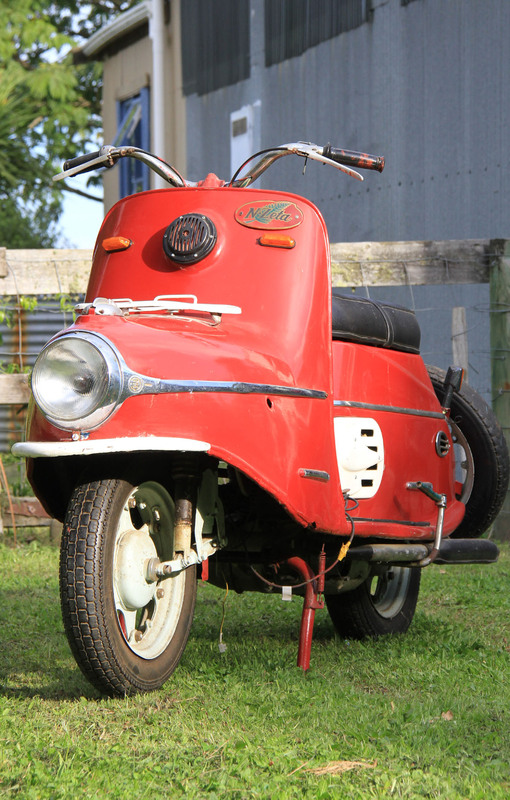 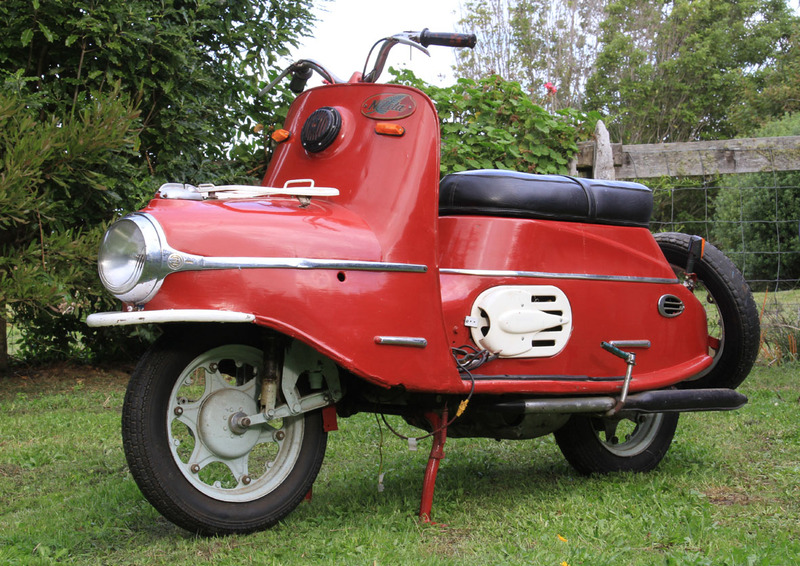 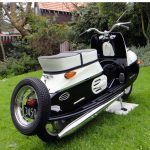 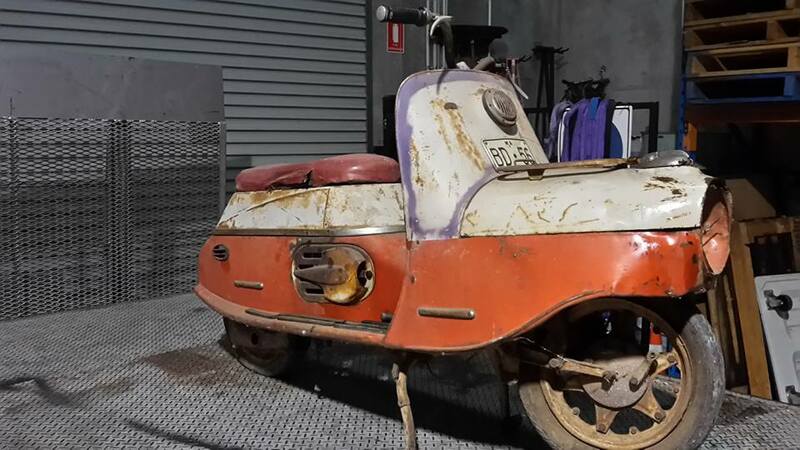 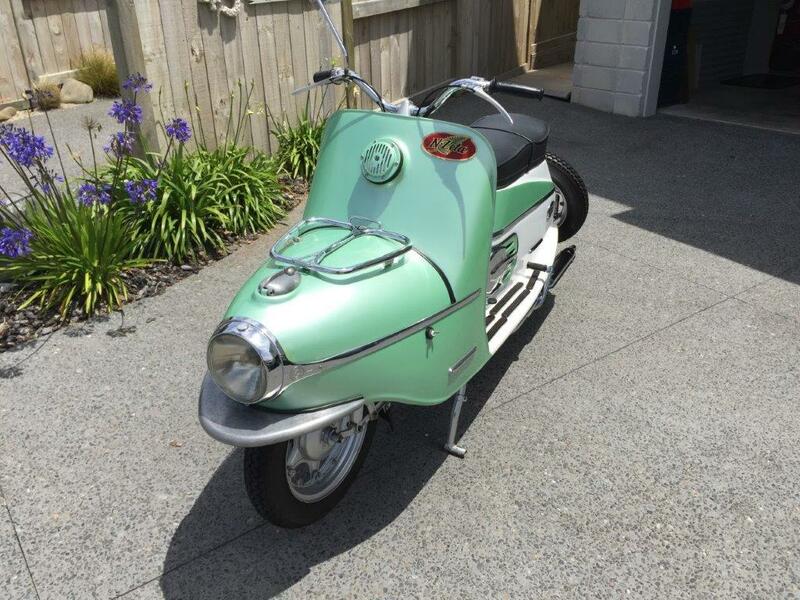 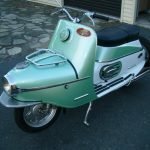 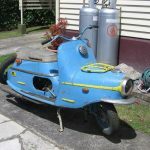 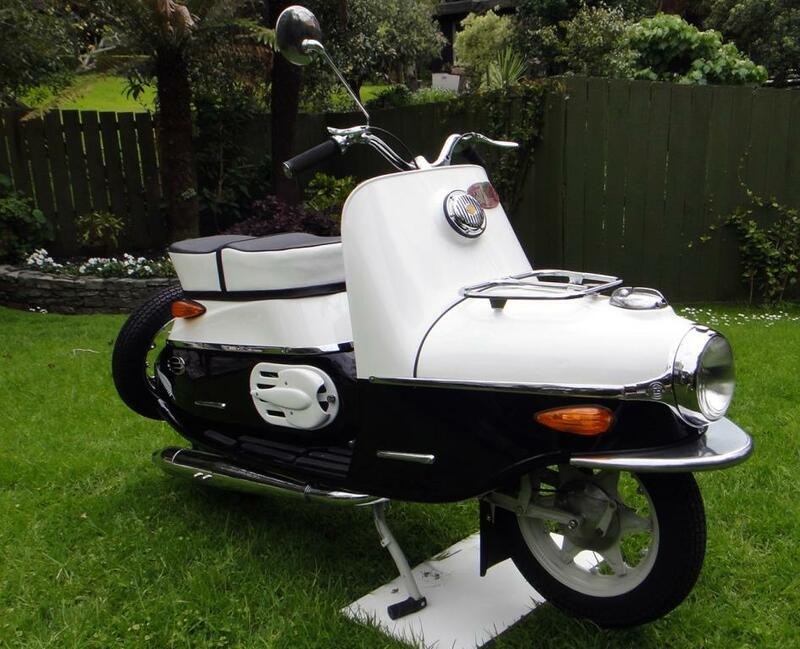 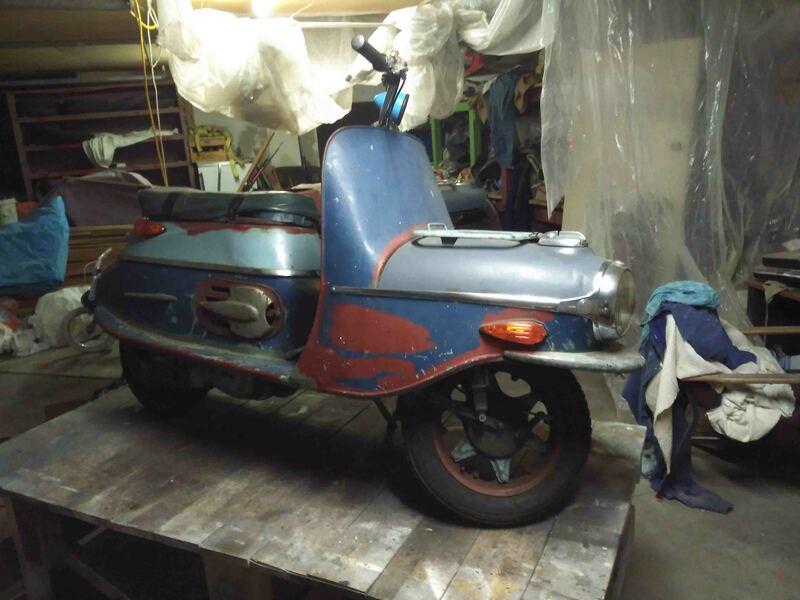 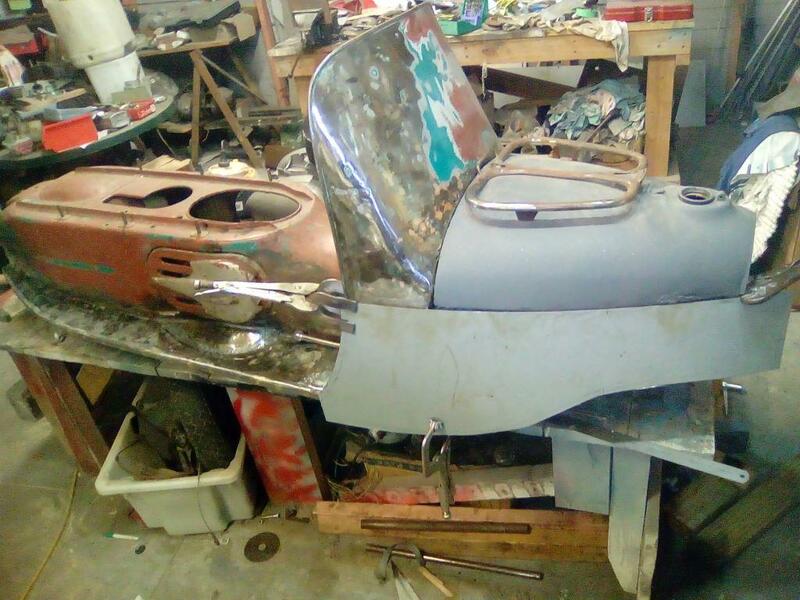 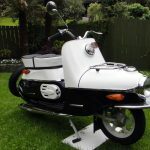 This 502 model NZeta scooter, was for sale on Trade Me in Kaponga, not far from me in New Plymouth. 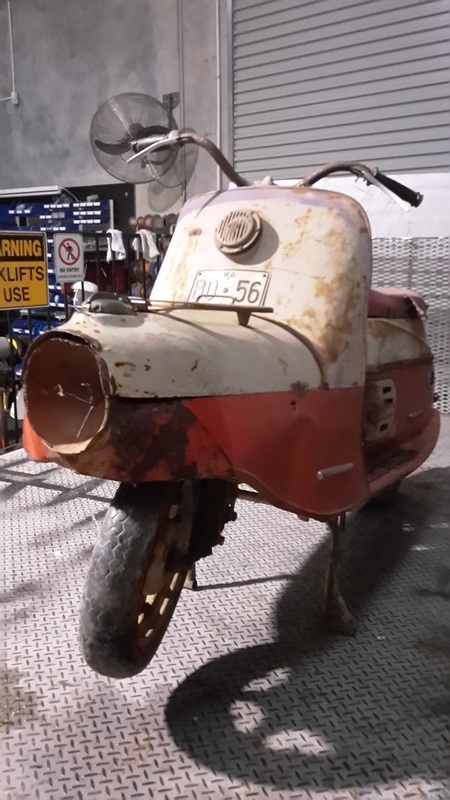 Turns out it was owned by Roy King, bit of a legend when it comes to old cars, motorbikes, scooters, so was great to meet him and see his projects, and all the weird and wonderful vehicles in his ever changing collection. 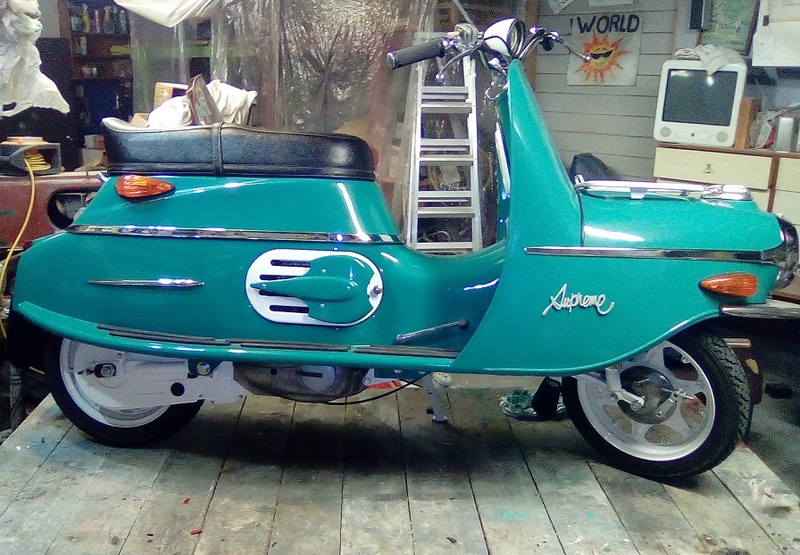 I had a 501 at the time, but had sold a bigger road bike to fund the hobby, so had more to spend, so did a buy now with Roy. 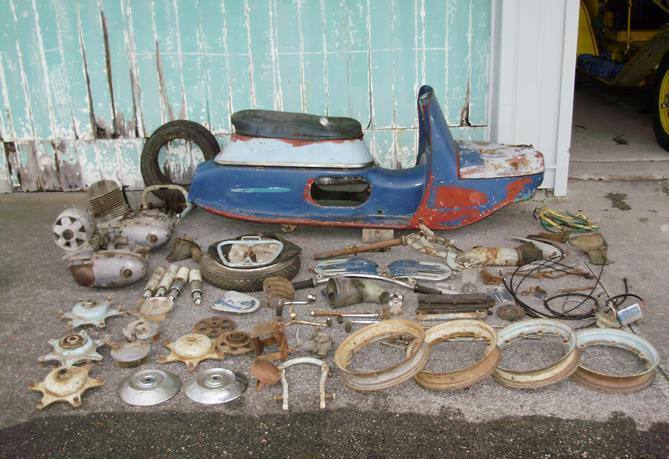 It was missing a heap of parts, although the body seemed in OK nick. It basically had enough parts to make a rolling chassis, and not much more. 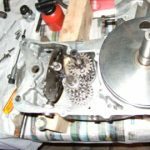 A chap saw me online at JawaChat site and rang up from the other side of Mt Egmont, saying he had a motor and and some other bits. 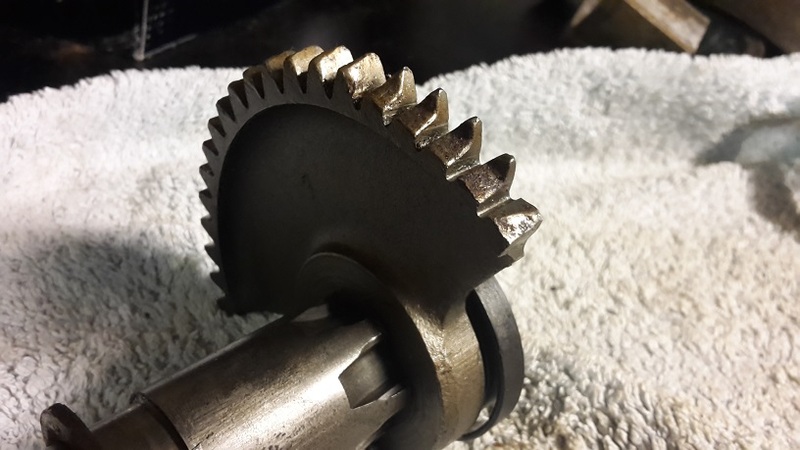 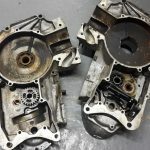 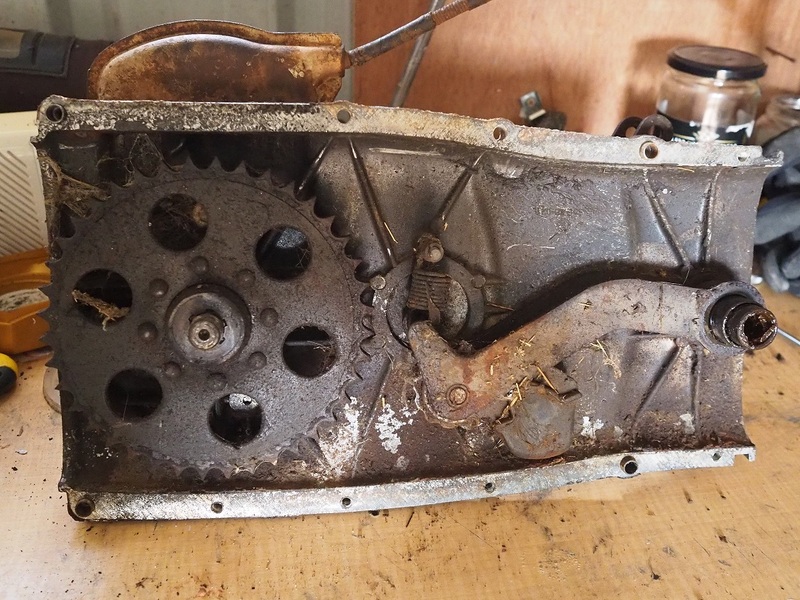 The engine was covered in crap, missing the conrod and piston, but at least intact… I have seen so many engine casings with damage, especially near the front sprocket, but this one was really good. 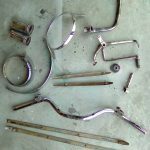 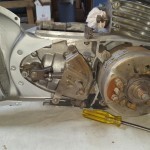 Got the rod and new piston from Alan Cleaver, as many other NZeta and Jawa bike owners have. 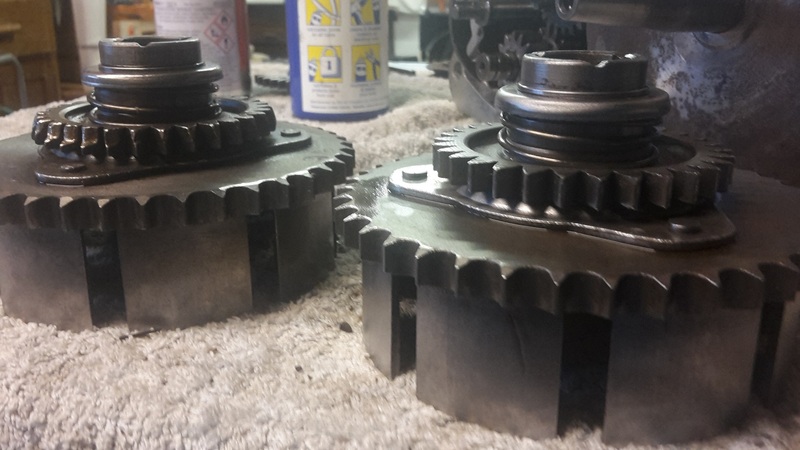 A nice chap is Alan, always happy to help, knows his stuff backwards. 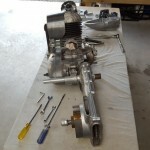 I got the engine rebored with the new piston, made a new header pipe that avoids the side stand completely, did all the panel work and painting myself, made the wiring loom and soldered all connections, cleaned buffed and polished for what seemed forever. 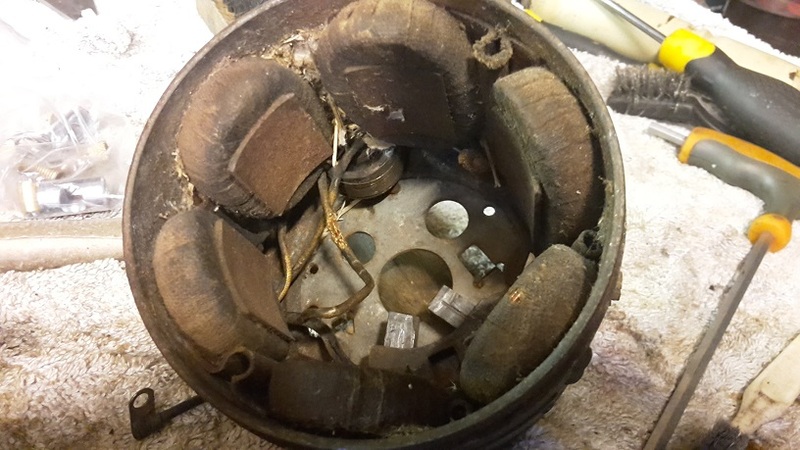 I am using 1x 12 volt battery and it’s working well, provided the rest of the system is clean and brushes and commutator in good working nick. 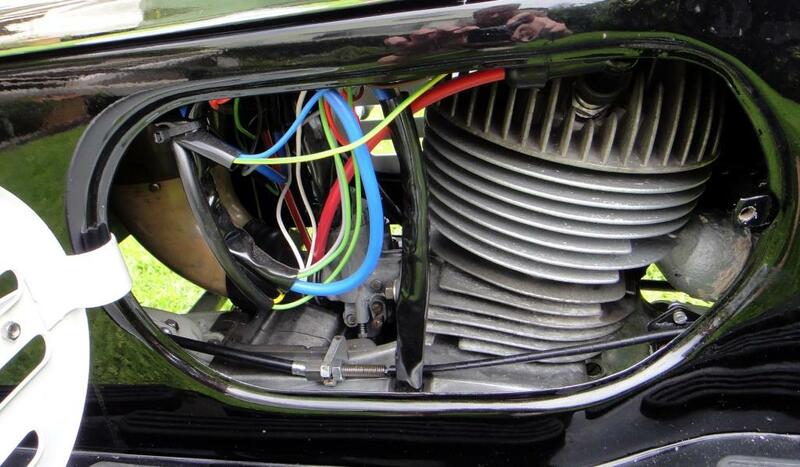 I have just replaced two worn brushes and this made an instant difference to charging and dyna-starting. 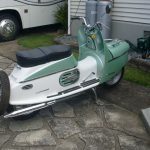 The nice thing about riding this is that everything is tight, no rattles and clunks, all bearings and seals everywhere have been replaced, inside engine and all wheels etc… Brake shoes are new and the drums work fine when adjusted well ( i found some new old stock shoes still in great nick, not perished or dried out), and all rubber parts are correct except the chain guard strap. 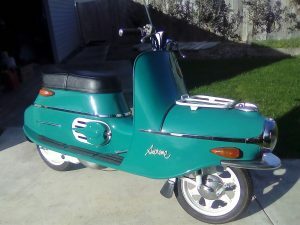 All in all, I bought this body 9 years ago, then bought our first house and had kids. 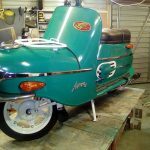 I also did a full restoration on a 501 since then too, but none of anything was really done in quick time, just when time allowed. 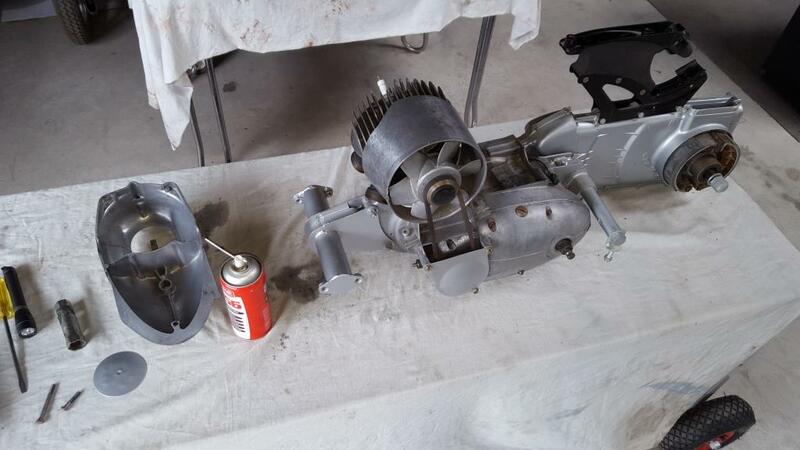 With this 502, every now and then I gathered up new info, or spotted parts I needed for cheap… finally I got the dosh and time to finish this. 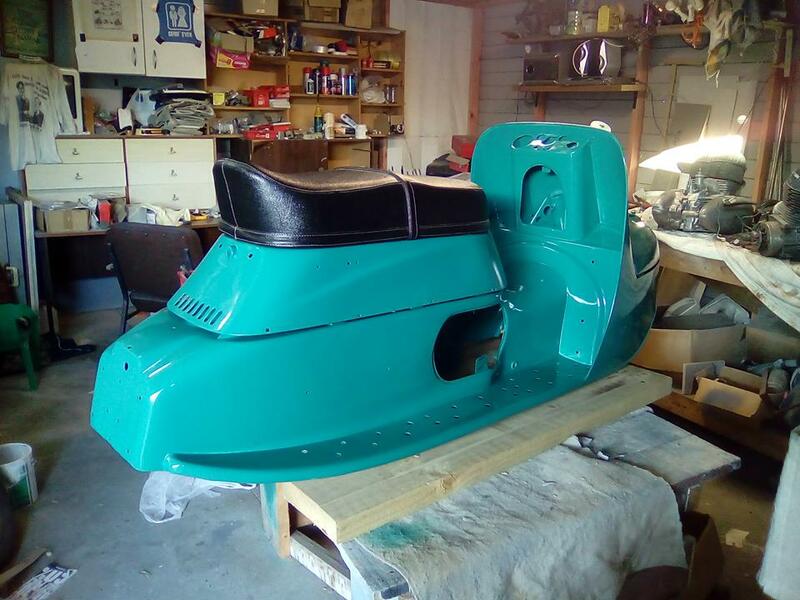 This of all projects completed, is the most satisfying, I guess just for all the hours put into parts searching and overall taking so long. 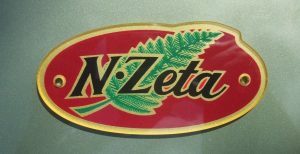 I have been fortunate to meet all sorts of inspiring and helpful Jawa and NZeta people since I first got into NZeta’s about 10 years ago, so shout if I can perhaps help anyone else. 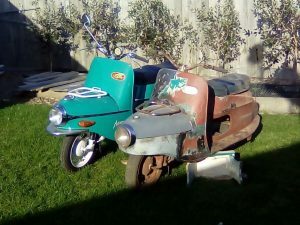 Now for the 350cc J-Zeta, that is the next project (along with a rusty Mini), hope it does not take another 5 years though. 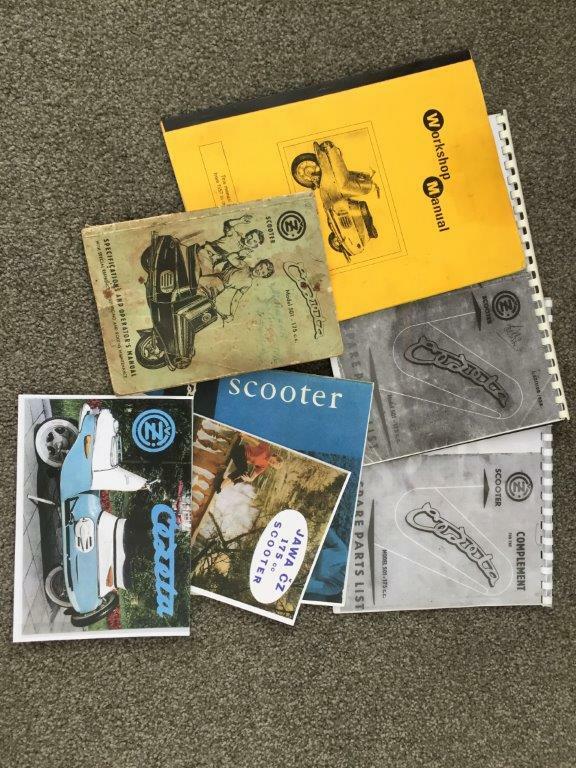 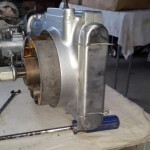 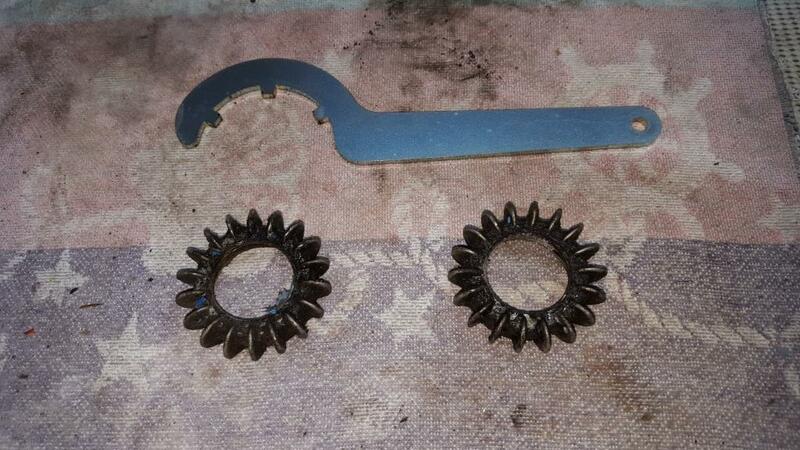 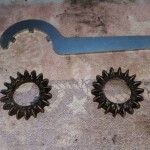 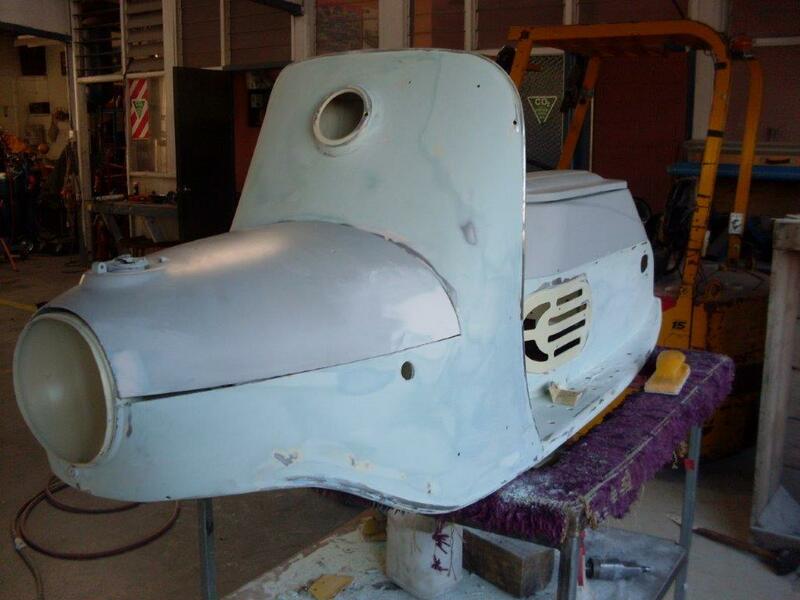 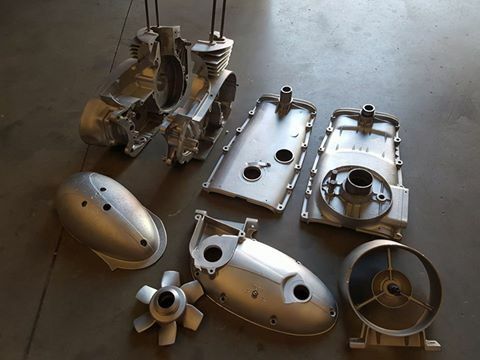 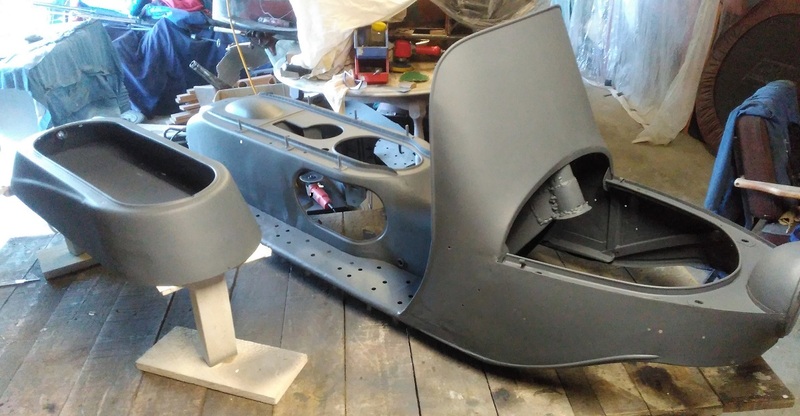 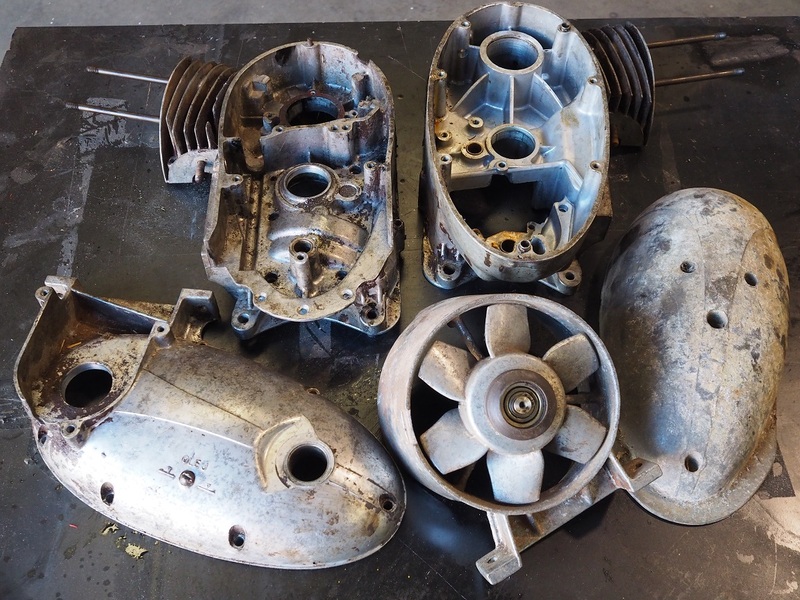 Jo has sent these pics in for his Cezeta 501 restoration. 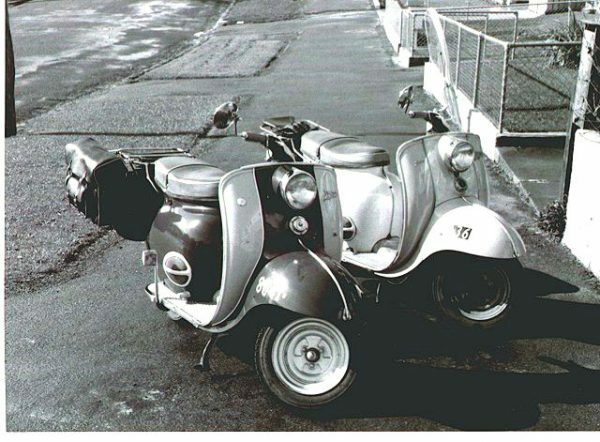 good luck with it Jo. 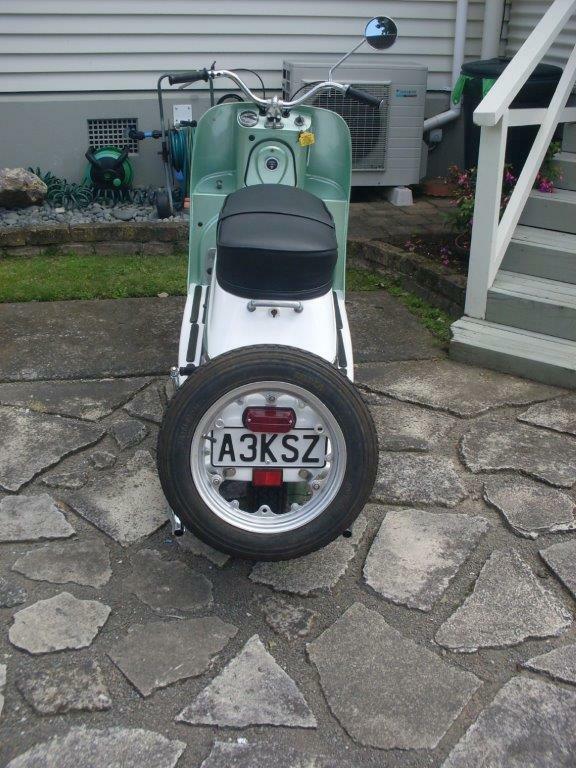 Mark is looking at getting new NZeta 502 Type plates made up, as per the plate below. 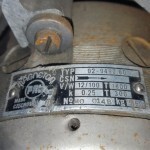 The standard Czech 501 type plates are available online. 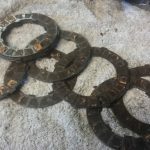 If you are interested in getting some reproduced than let me know through the contact form. 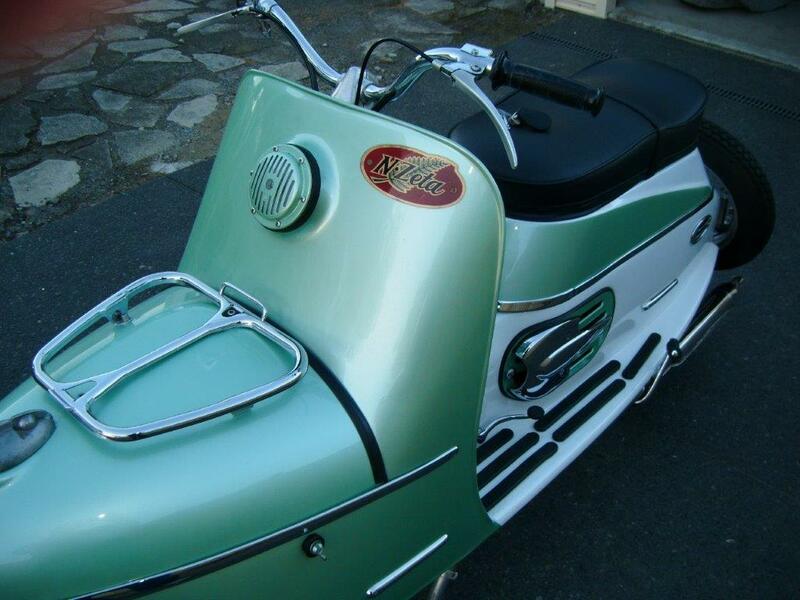 Mark has had some new badges made and they are currently for sale. 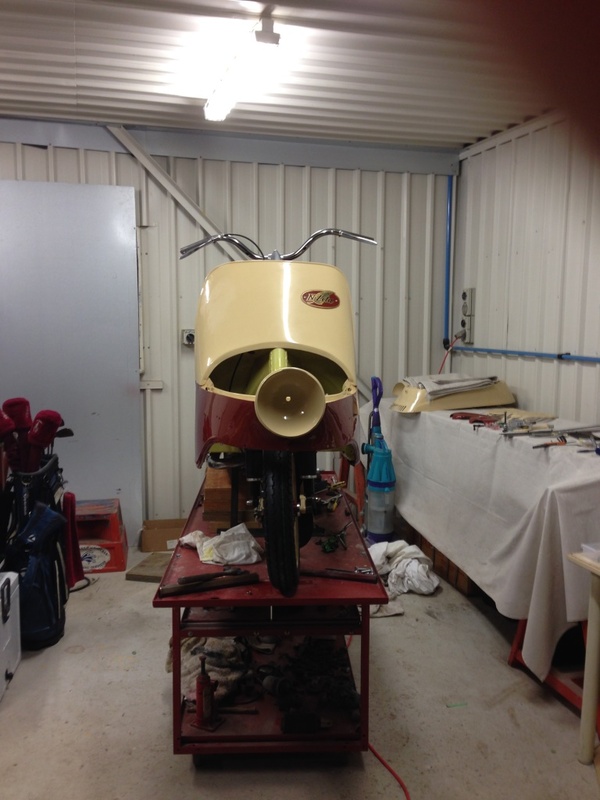 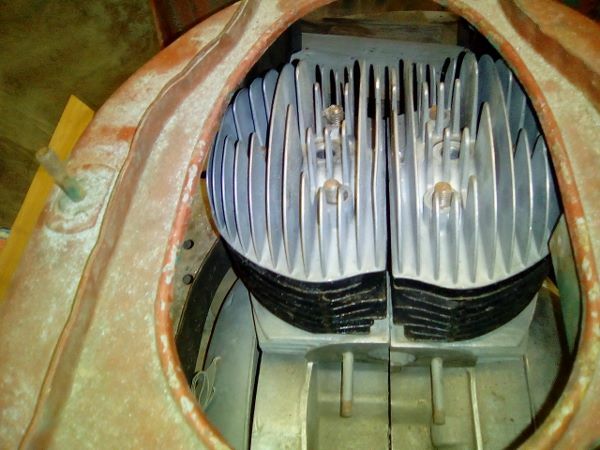 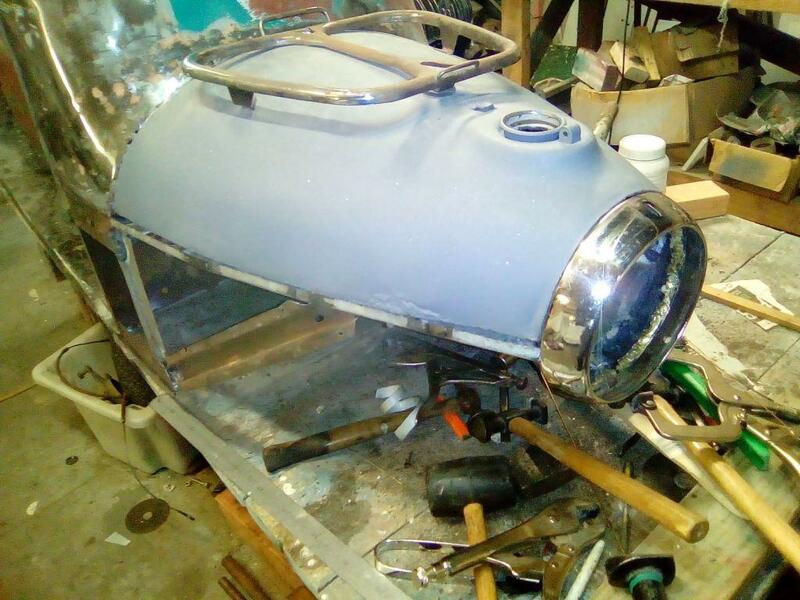 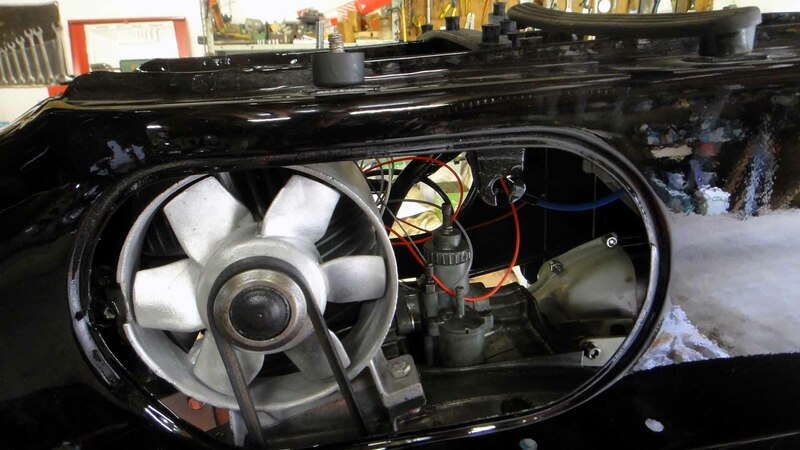 Steve sent in some pics of his 1959, Cezeta 501 – 03 that he is currently restoring. 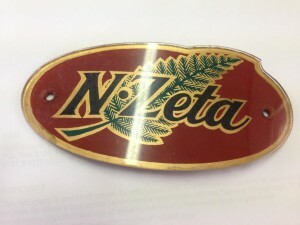 I you have been paying attention you may remember that I “finished” my N-Zeta before Xmas. 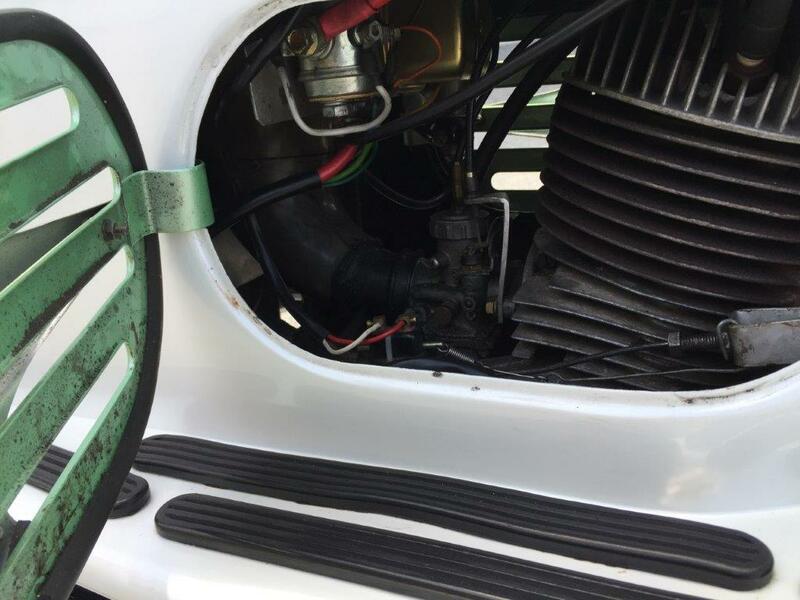 It ran, but was very hard to start – only way to get it going was to squirt some fuel into the plug hole. 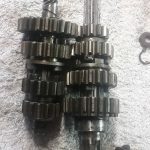 Discussions with the local JAWArati implicated the crankcase seals, items I had not replaced during the engine rebuild. 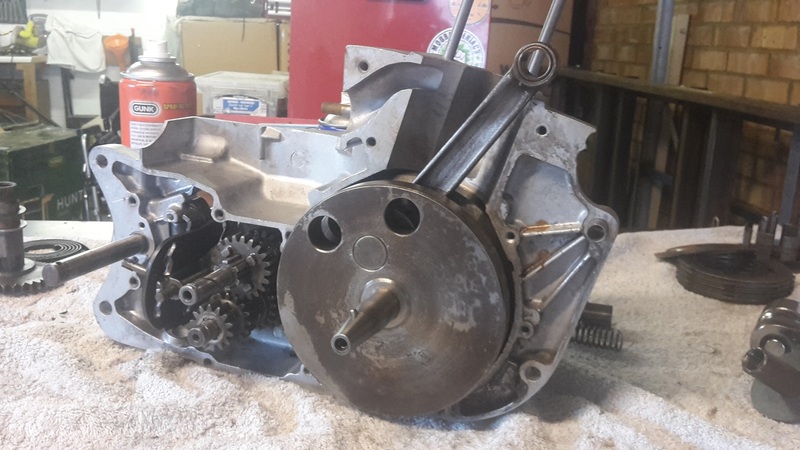 Being a 4 stroke kind of guy I underestimated the importance of keeping the crankcase airtight. 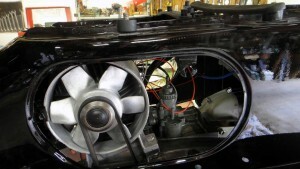 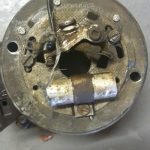 I replaced the easy seal on the generator side which improved performance, but not starting. 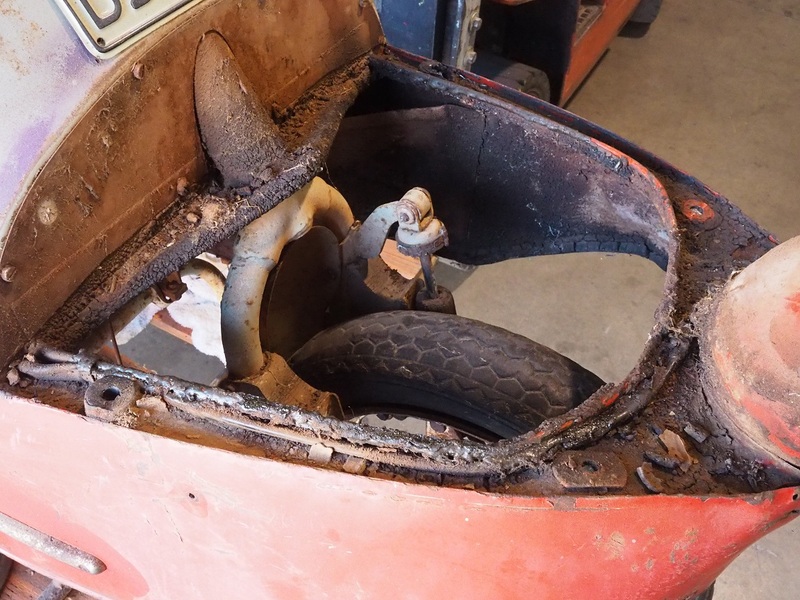 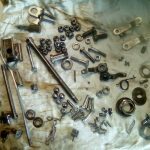 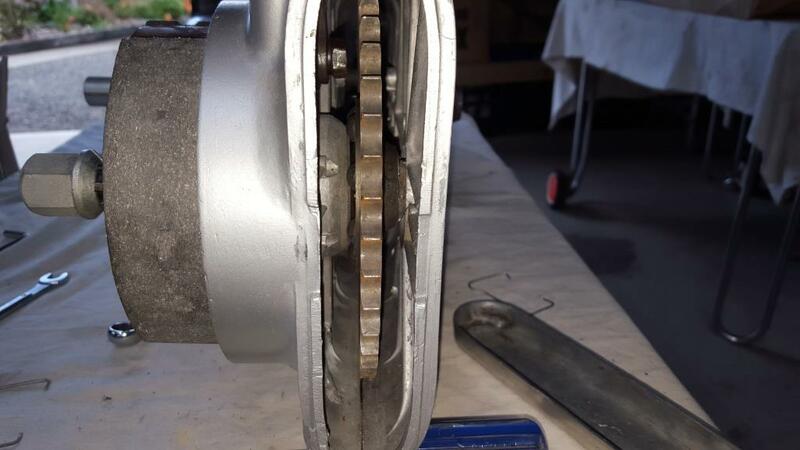 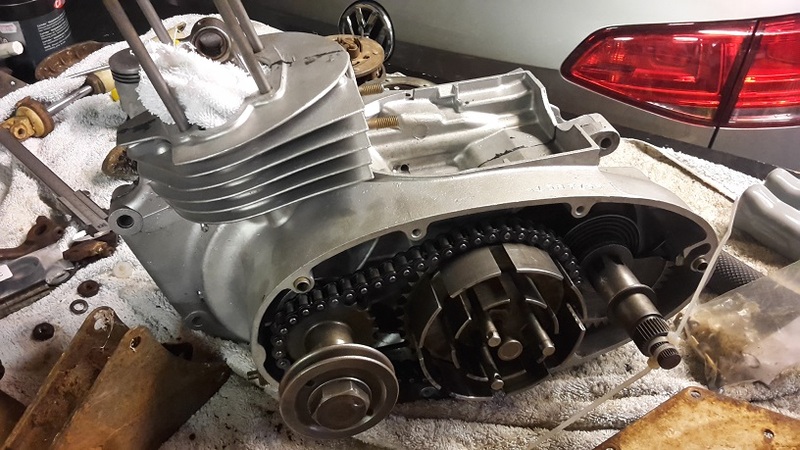 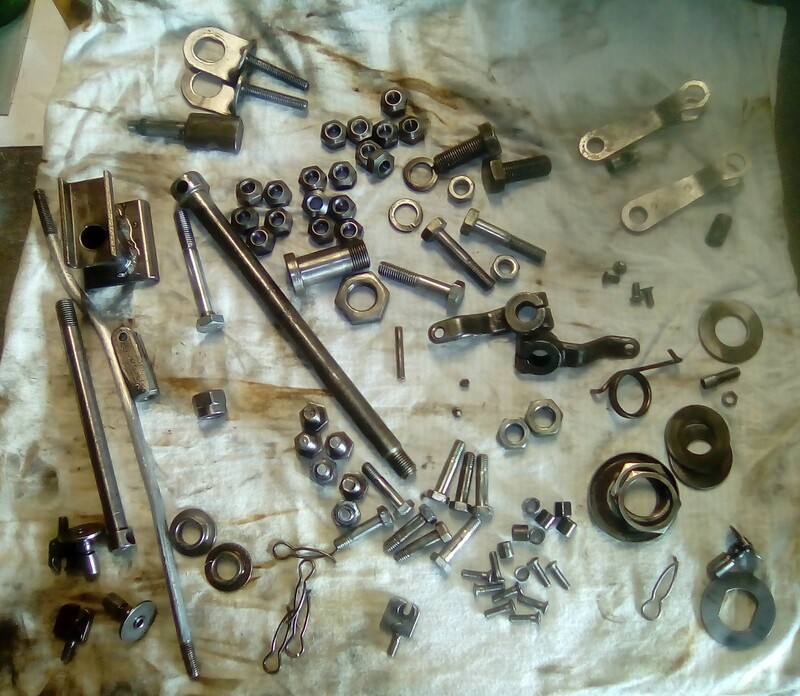 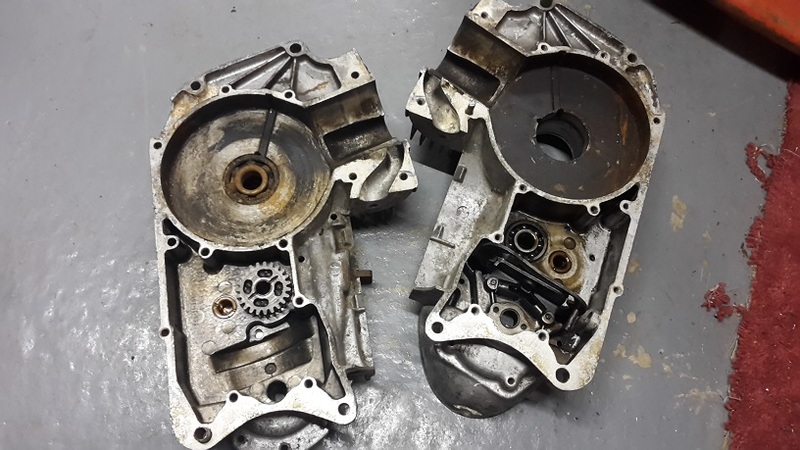 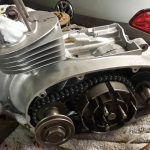 So, in January I dropped out the engine and stripped it right down – again, including removing the bearings. 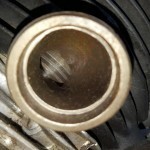 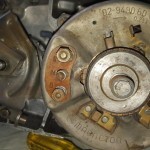 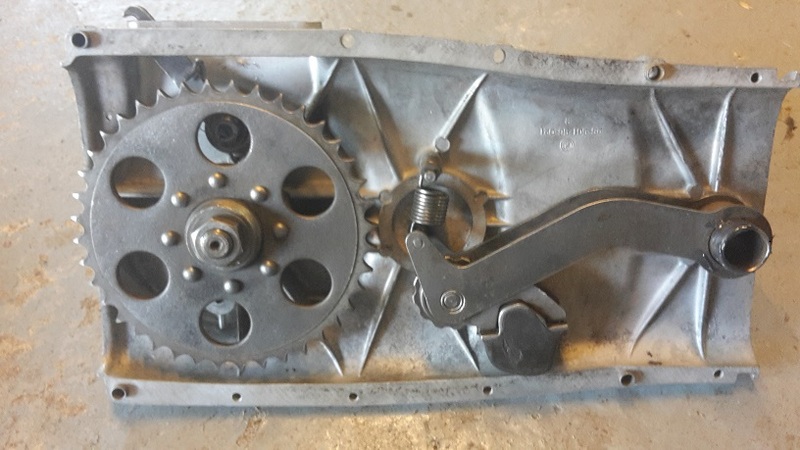 The strange aluminium “labyrinth” seal between the two clutch-side mains was totally devoid of oil and had chunks of metal missing from the ridges. Happily, Alan Cleaver in Cromwell had one in stock for about $15. 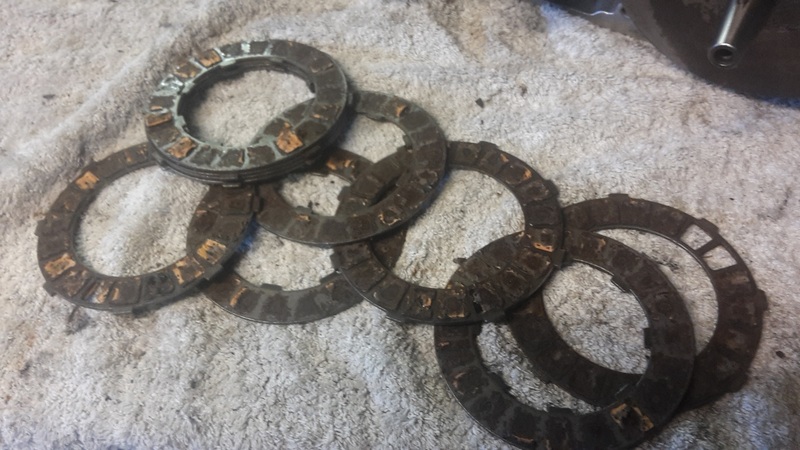 While I was at it I decided to replace all other seals and bearings and these were all available locally – $77 for the five bearings and about $30 for the seals. 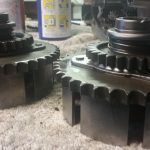 The bearings were the sealed for life type so I took out the plastic rings – I think sealed bearings are only good for wheels etc. 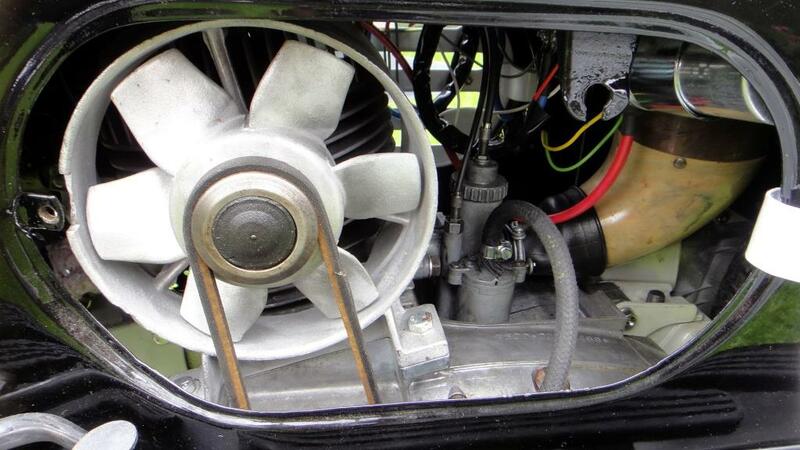 and not the higher speeds in an engine. 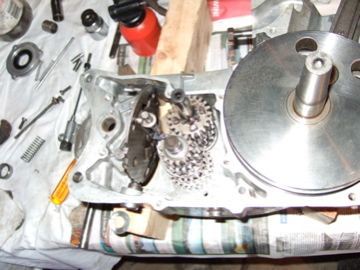 Put the engine back in and bugger me it started first turn of the key! 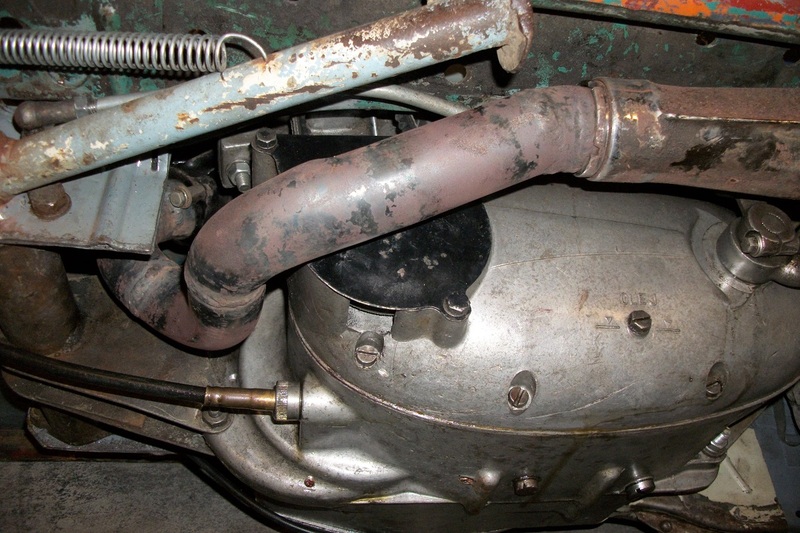 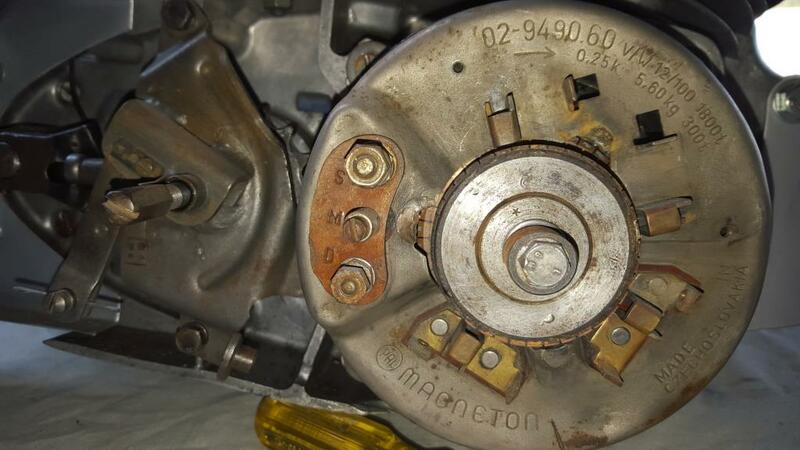 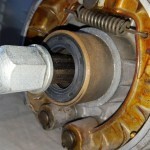 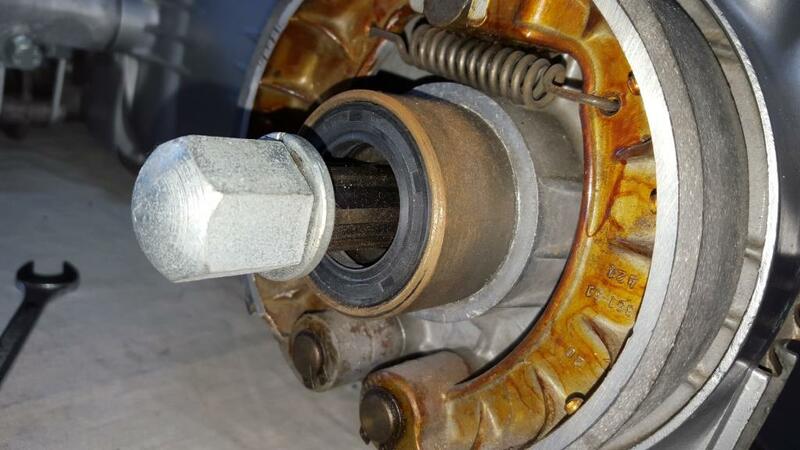 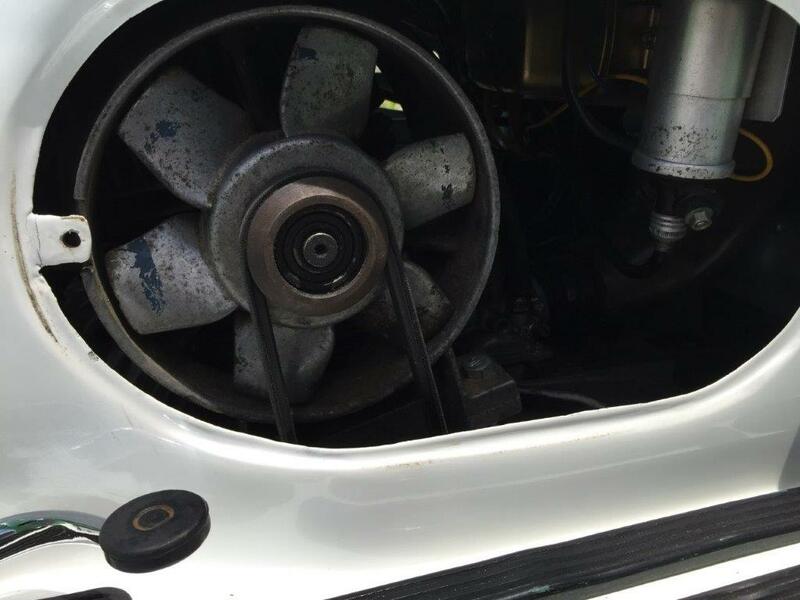 Also, using silicone instead of paper gaskets made the engine oil leak free – it had leaked before. 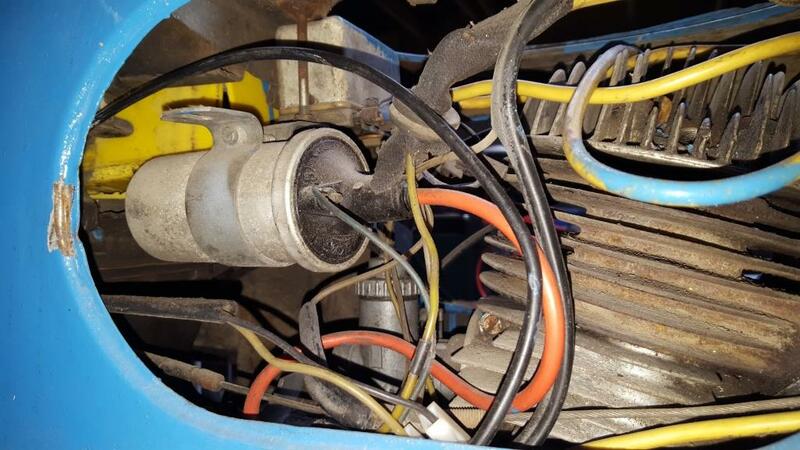 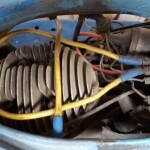 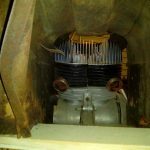 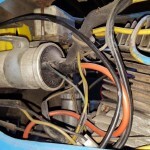 The other issue was that the generator did not work first time round, and the starter only worked sometimes. 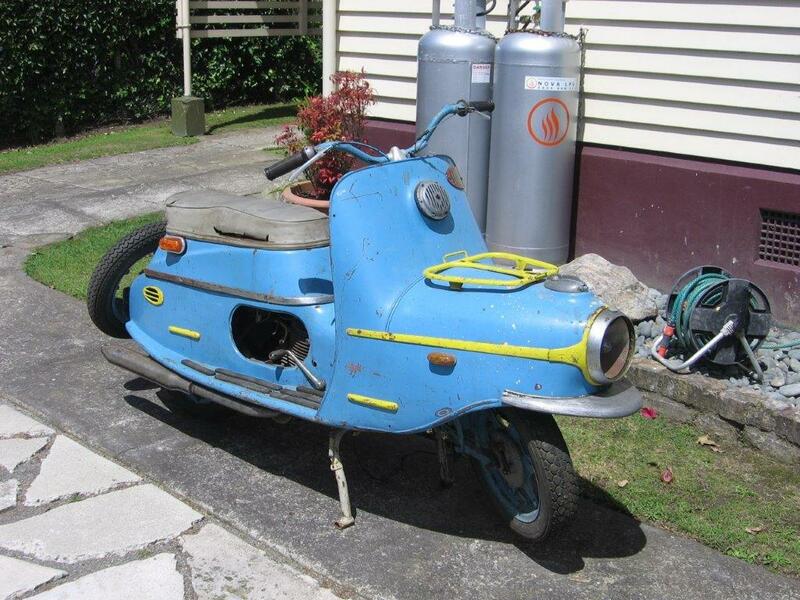 I replaced it with a rather scruffy looking one from a spare engine I had picked up on Trademe. 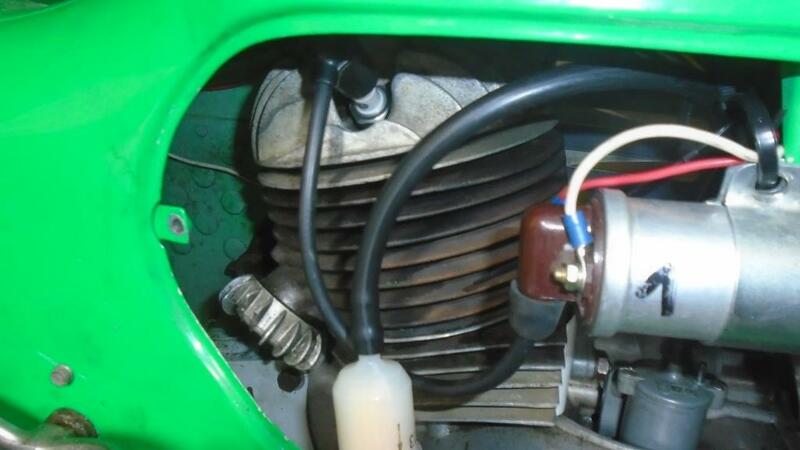 Was very pleased when the ignition light went out and the starter works perfectly. 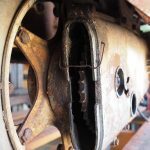 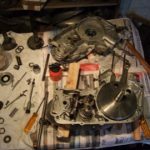 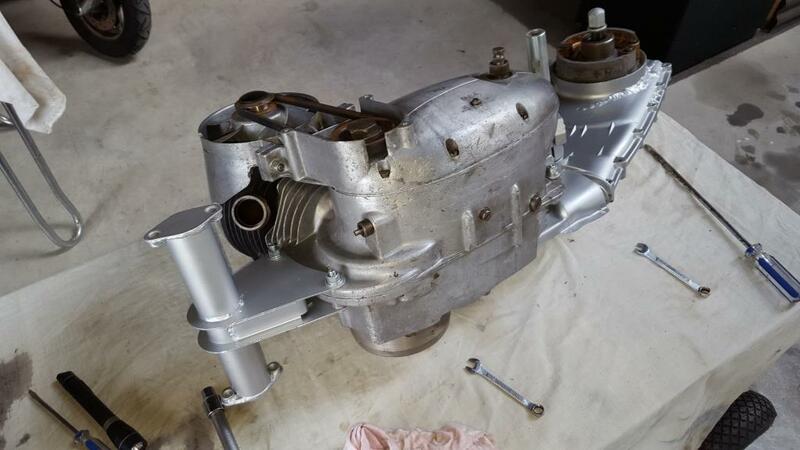 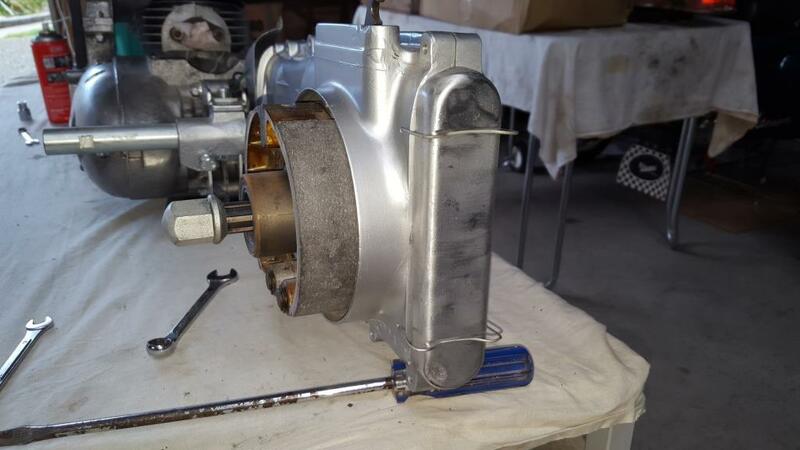 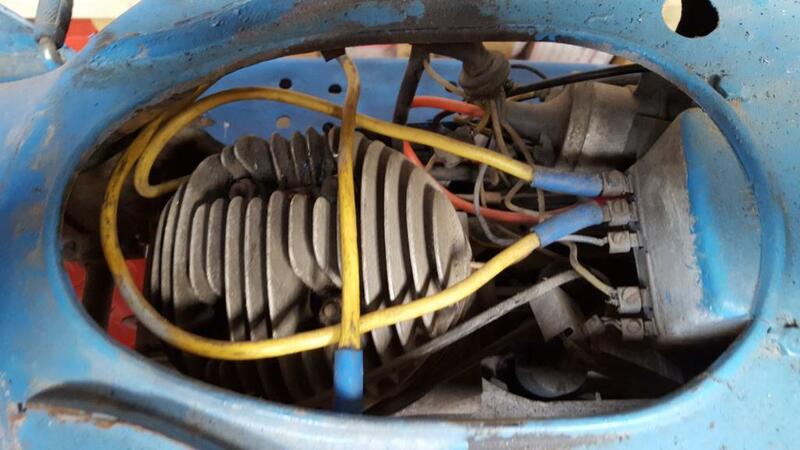 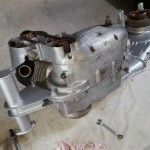 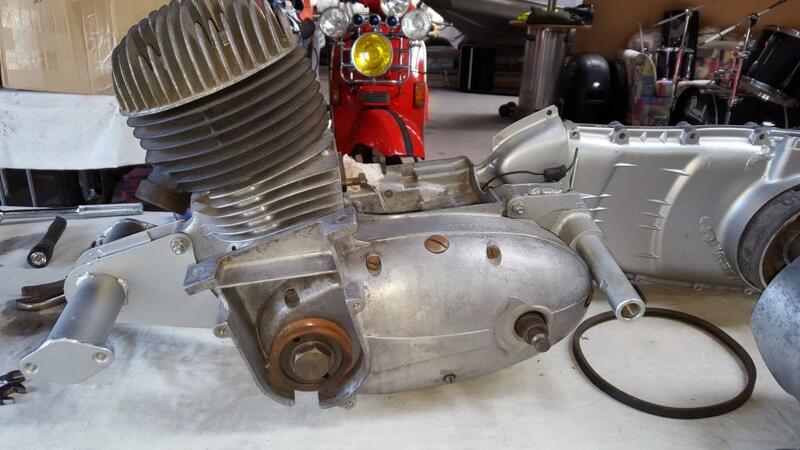 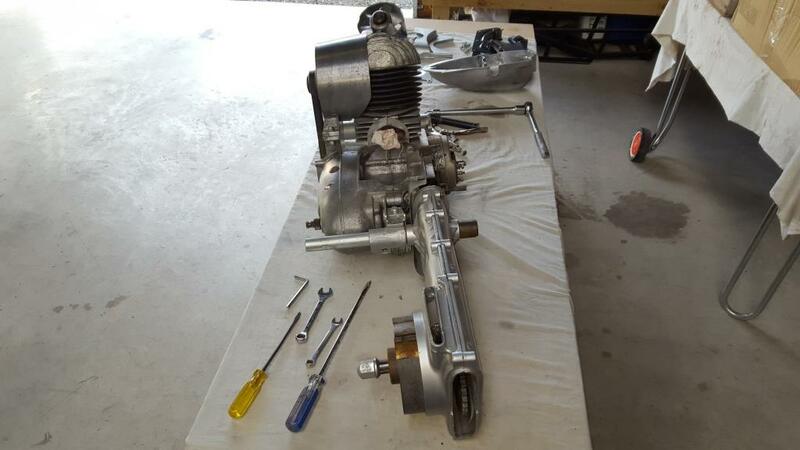 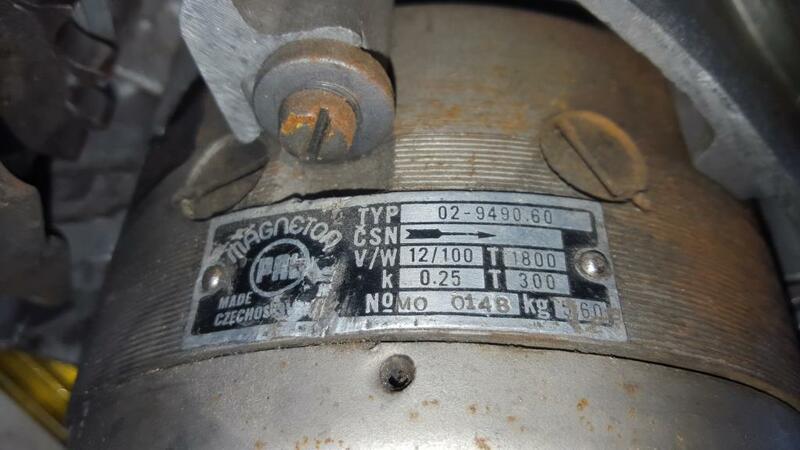 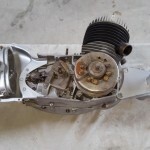 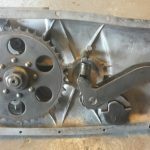 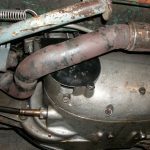 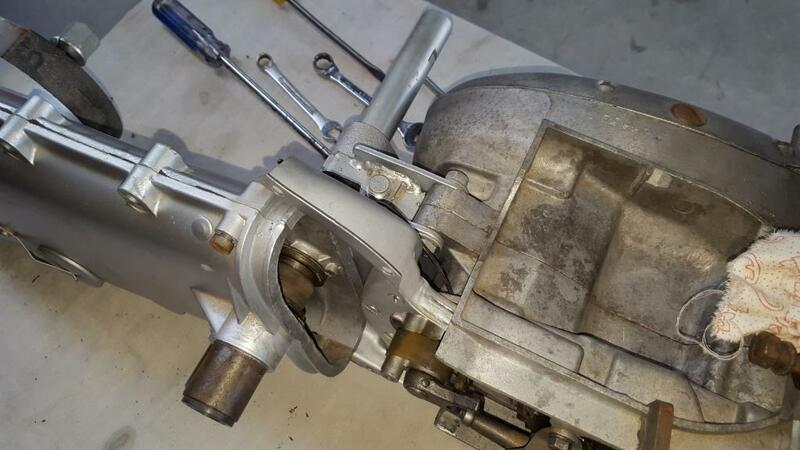 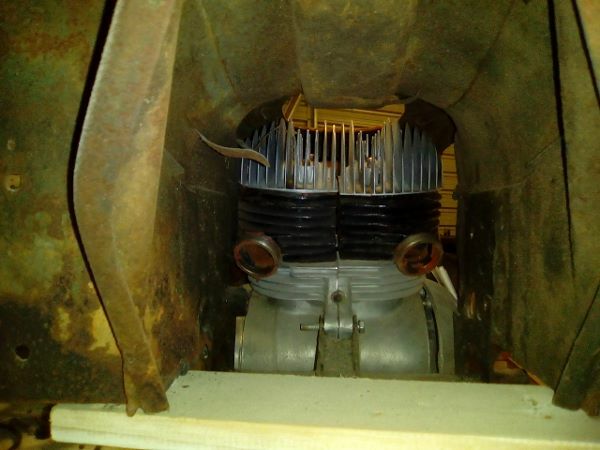 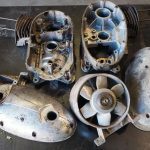 Another annoying little issue was that the carb would leak on standing if you did not turn the fuel off so I decided to buy a new original carb form Czech land – was not very expensive. 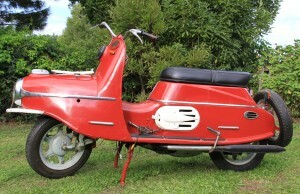 About 44 euro. 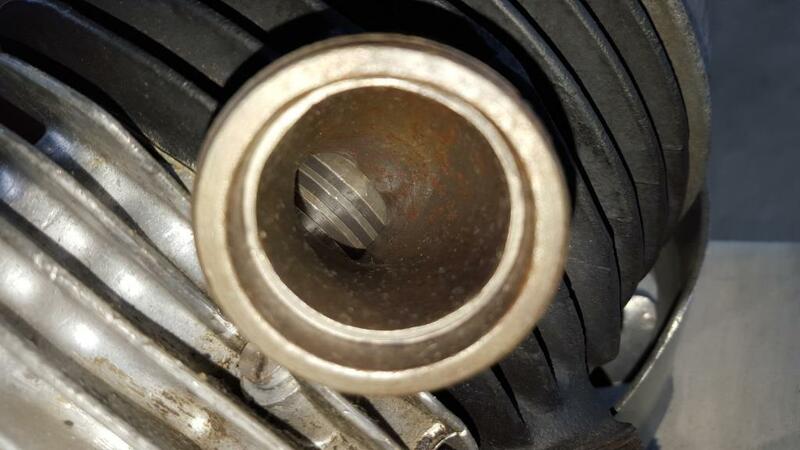 Strangely, it had a little hole in the choke tube which seemed to make it hard to start. 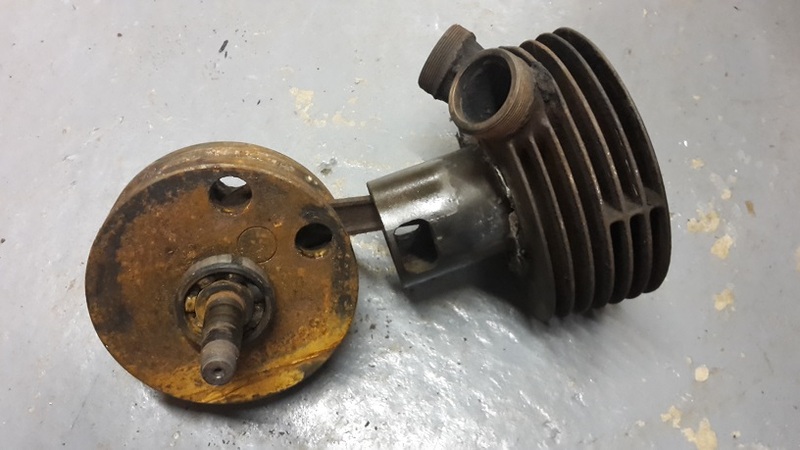 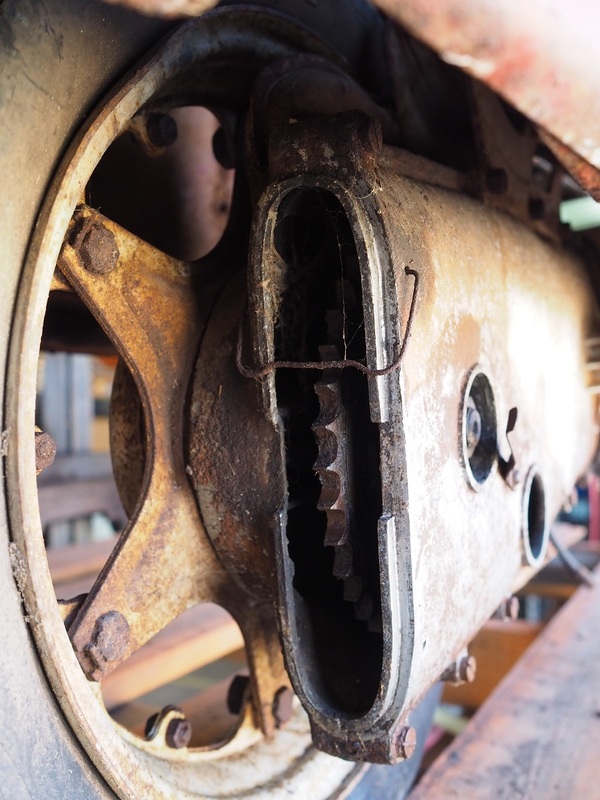 Old carb had the same hole, but it had been sealed off – looked like form new. 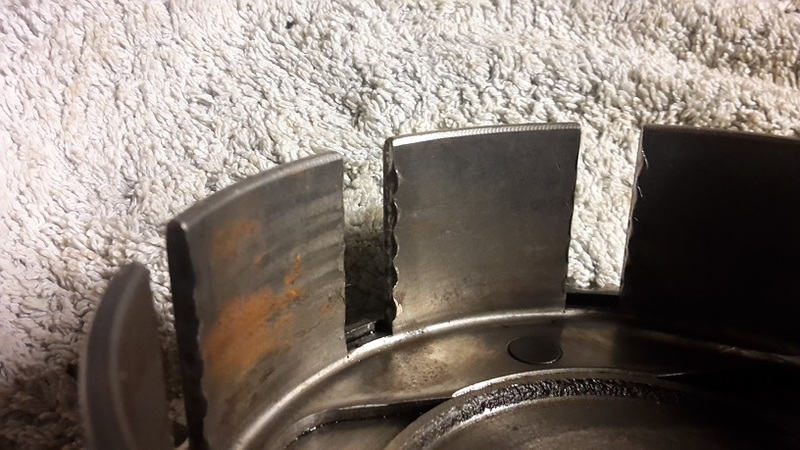 So, I sealed the hole with some JB weld and now it starts easily on the choke. 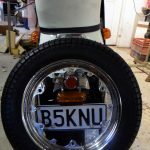 At this stage I was ready for the dreaded re-vinning process, but first decided to try and recover the original number plate. 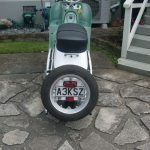 Land Transport said no because I did not have any papers, even although I had a receipt and a picture of the bike as received with the plate attached, and the number was available. 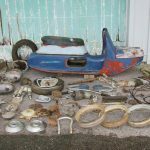 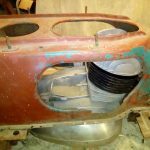 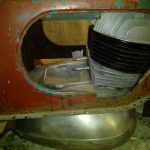 I appealed pointing out that they had let me reuse the plate on my 1949 BSA Bantam under exactly the same circumstances. 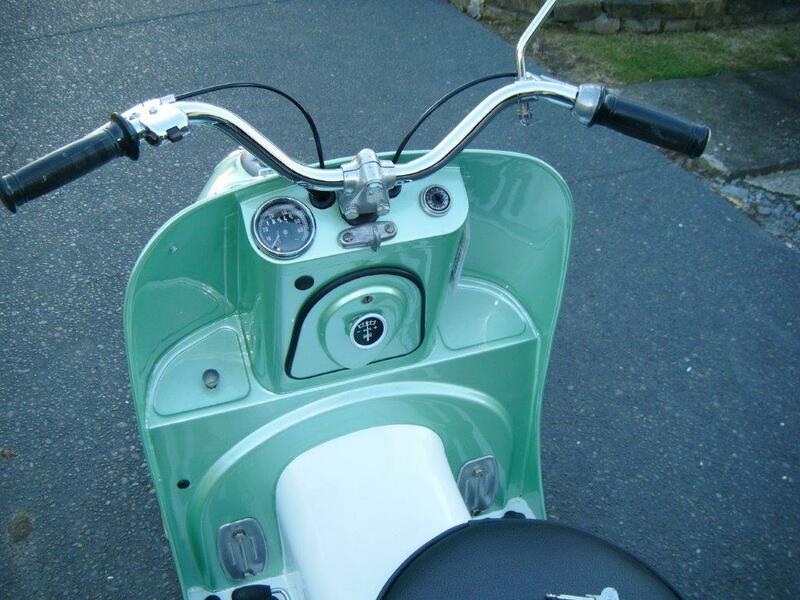 She responded, “that was a mistake”- this was the same woman from the BSA exercise! 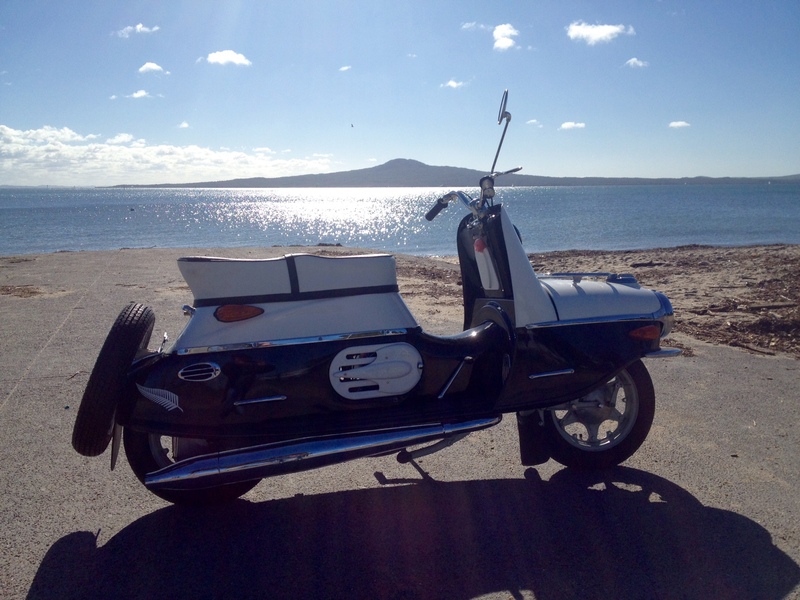 I now realise that arguing with land transport is like wrestling with a pig in mud – the pig really enjoys it. 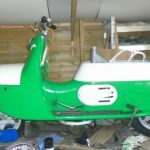 So I was all ready to go for the re-vinning, when I partially ruptured an Achilles tendon which meant I could not even get it off the centre stand never mind wrestle it onto a trailer. 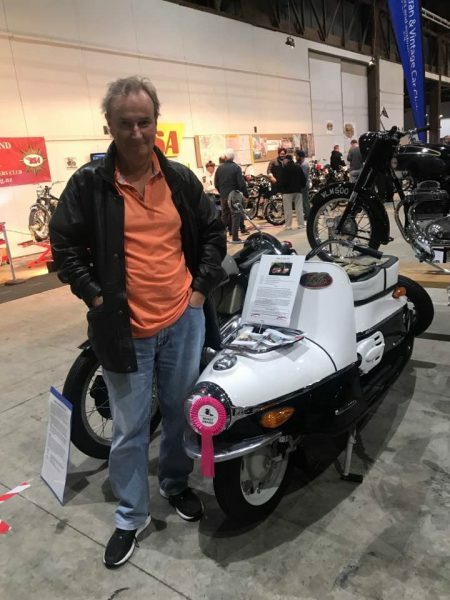 Even with two good legs I have always struggled getting it on and off the stand – no idea how the pretty little Czech girls you always see in the CEZETA ads managed it. 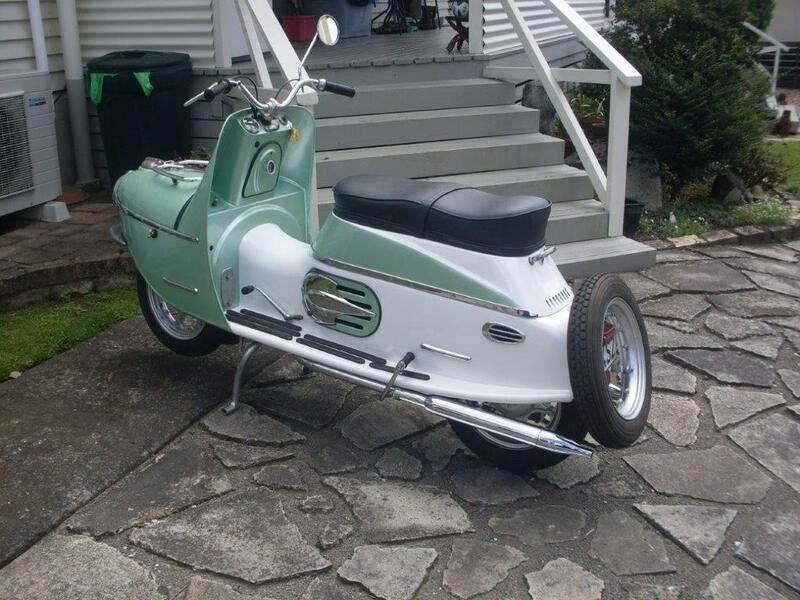 I can see why they went with a side stand for the 502. 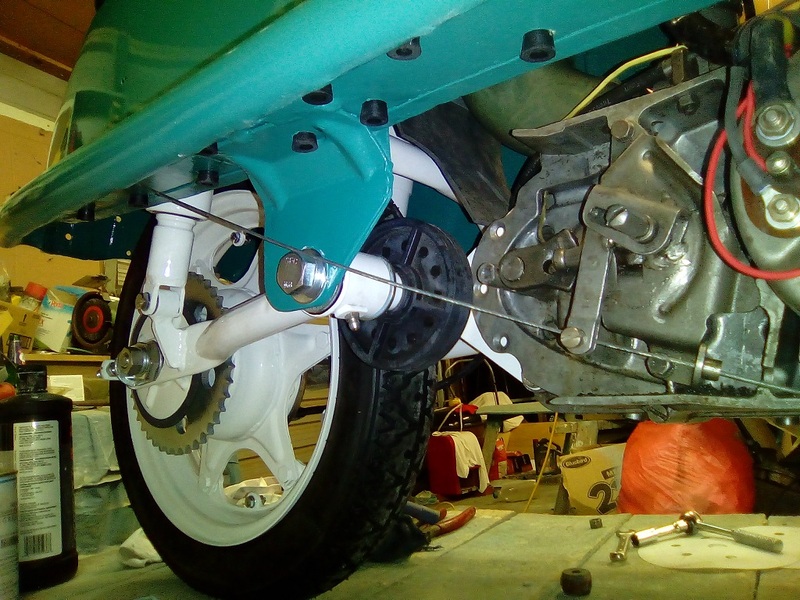 Anyway, while I waited for the tendon to heal I decided to try and fit a side stand while keeping the centre stand which is handy for maintenance. 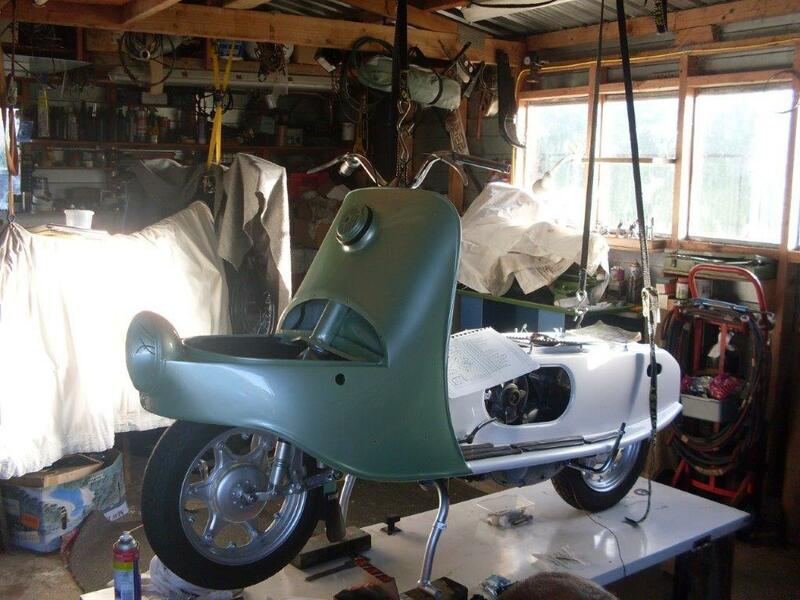 I do have an original 502 stand, but fitting it so it did not foul the centre stand looked like a bit of an engineering challenge. 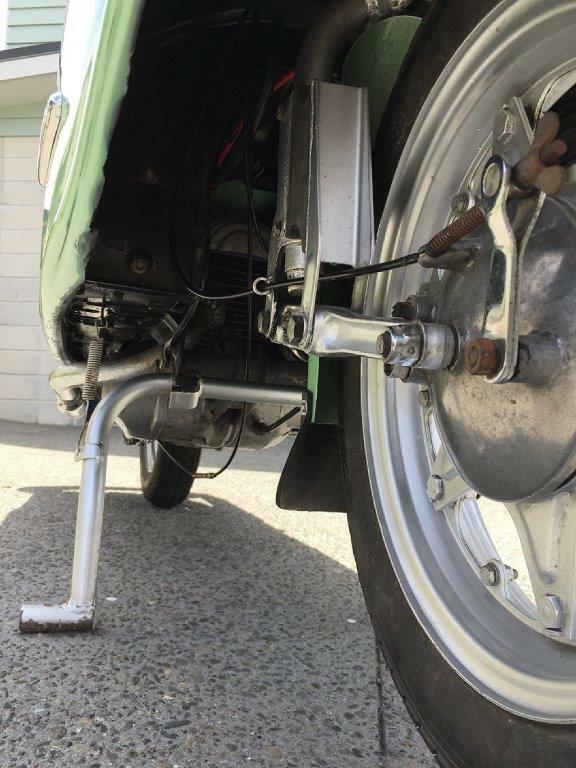 So, in the end I bought a nice chrome Harley side stand on Trademe and bolted that to the running board with two cap screws. 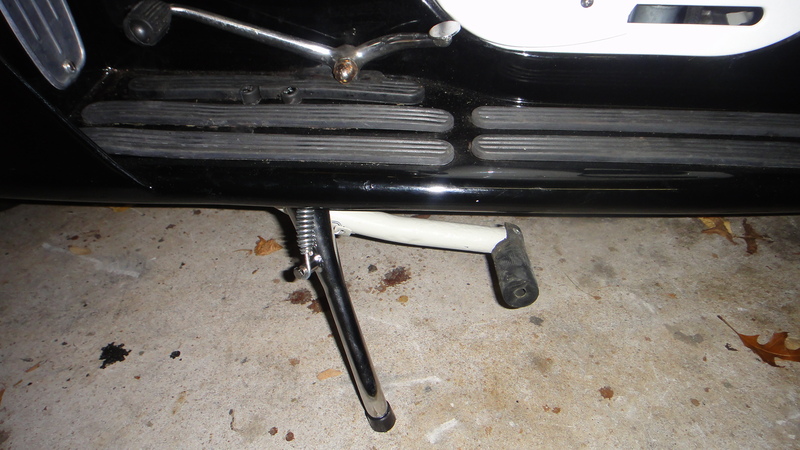 Had to shorten it a bit, but it works well and flips up forward out of sight under the front guard. 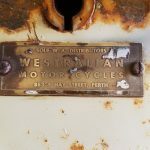 Finally got to the WOF place three weeks ago. 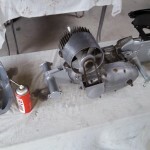 Was showing them how to work the lights etc. 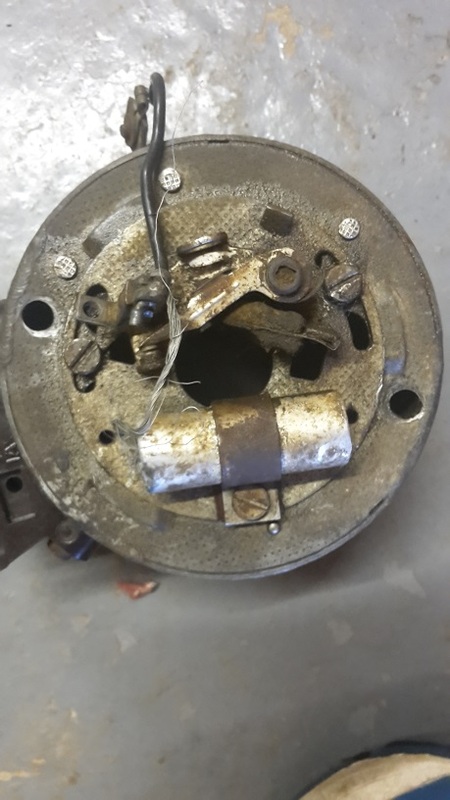 when the guy said “the stop light needs to operate with both the front and back brakes” which seemed like a major problem, but luckily an older and wiser inspector appeared and said back brake light only is fine on bikes of this age. 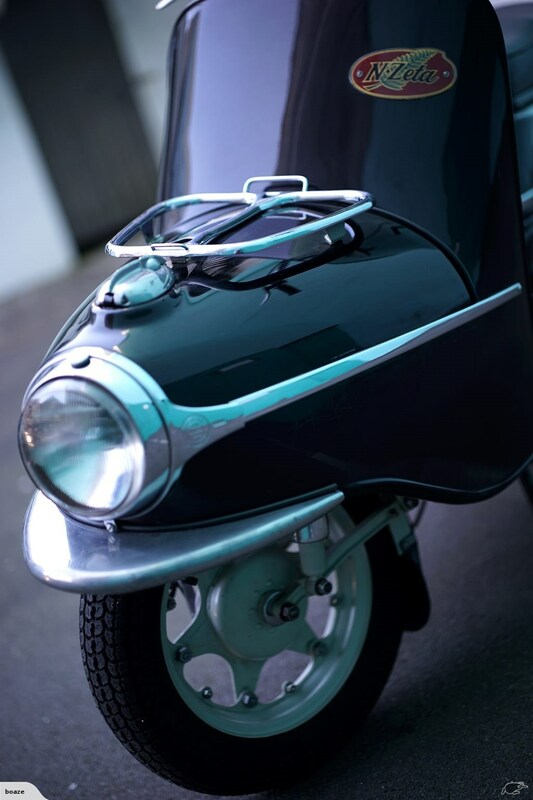 I had also omitted to fit a reflector, but the let me off with that on the condition I fitted one. 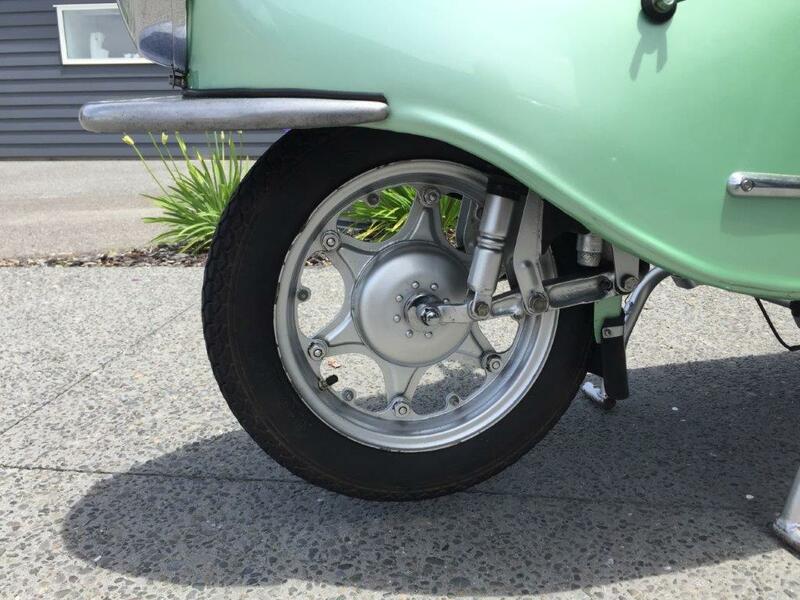 Found a nice little Lucas one on Trademe that fits perfectly inside the trailer hitch/spare wheel carrier. 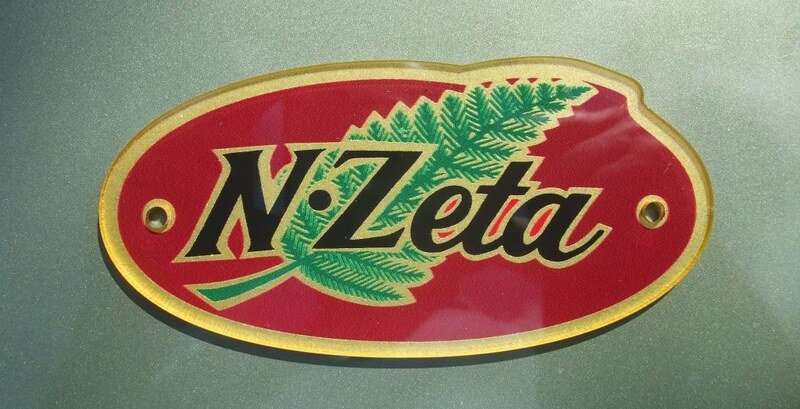 So that was it – finally legal and one more N-Zeta returns to the road. 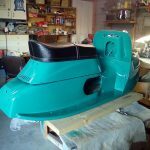 Total cost of revinning $339.82 including WOF and one year’s registration. 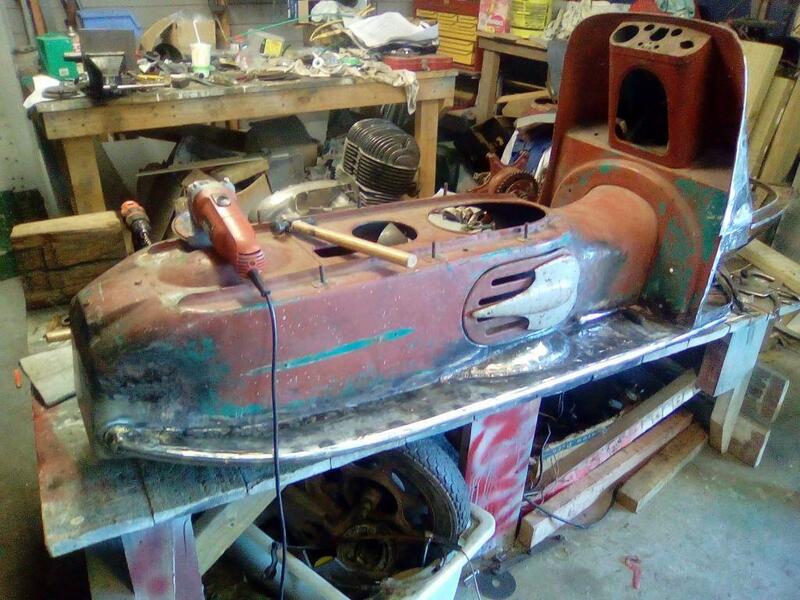 Total cost of restoration? 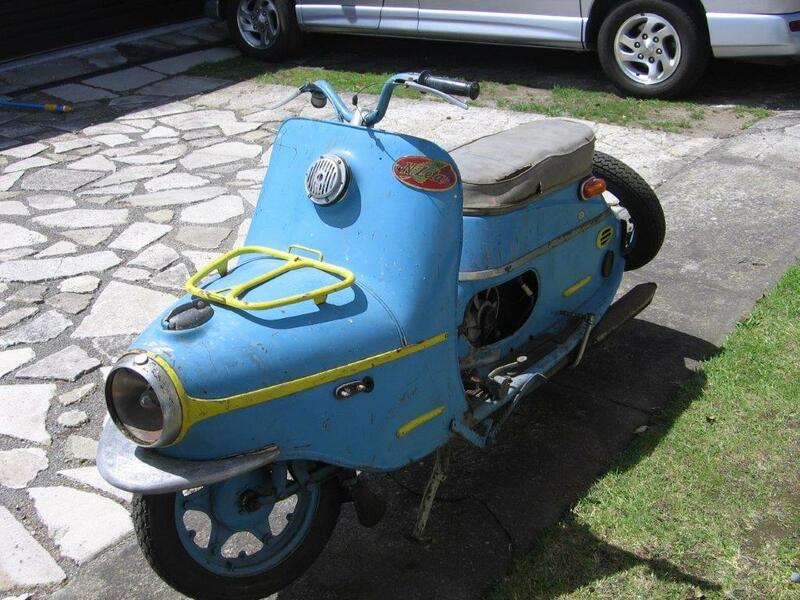 I stopped counting a while ago, but I think about $8,000. 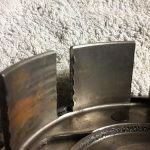 Thanks for your help and advice over the last few years. 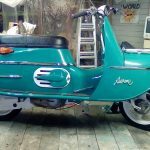 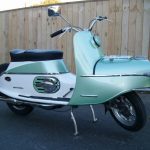 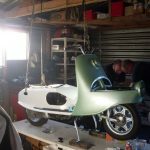 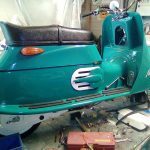 This is the latest update from Douglas with the scooter looking very smart. 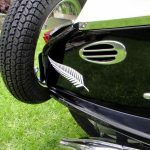 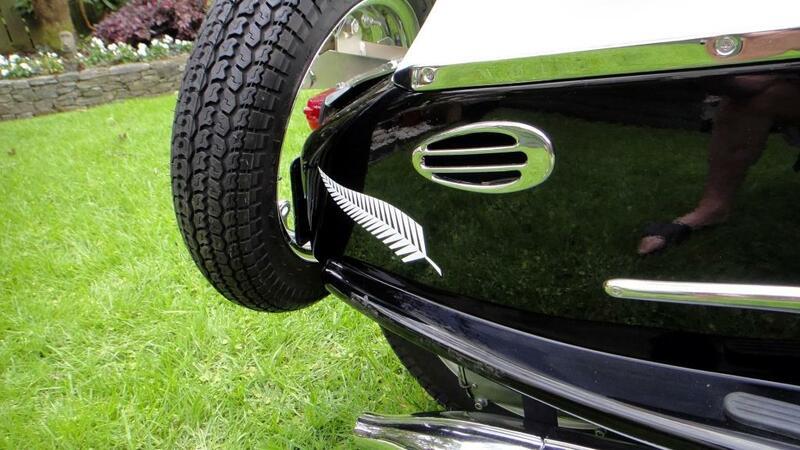 I really like the white fern, a very nice touch. 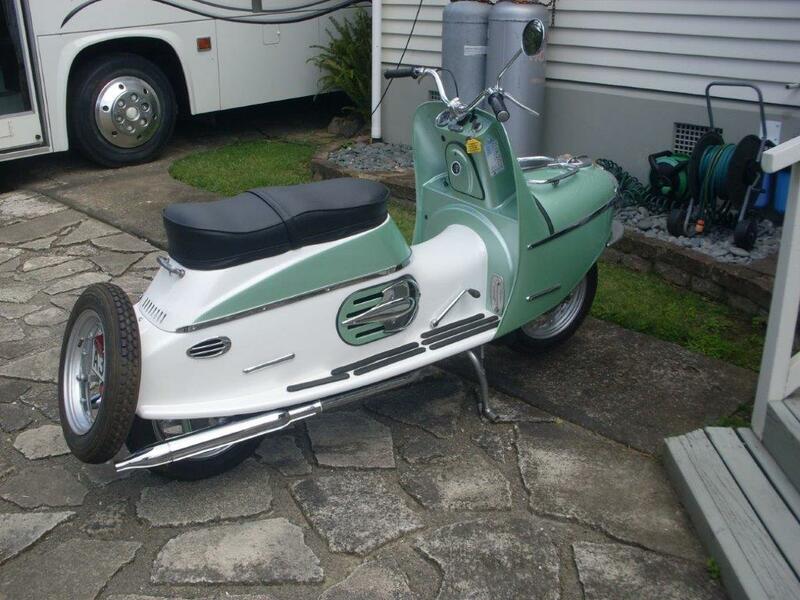 Sounds good and only a few minor things to sort out. Another NZeta back from the dead! Not too many NZetas in Fremantle! 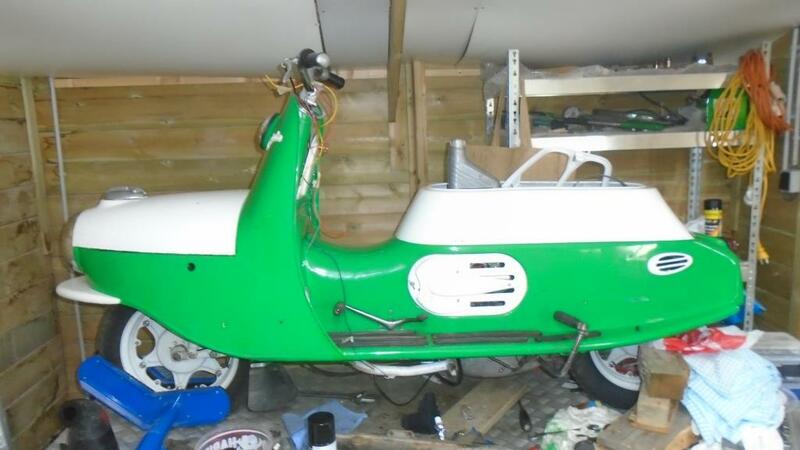 Still a way to go, to get it registered, but it STARTS! This NZeta 501 belonging to Elton looks in pretty good shape, It will be good to see how far he goes with it. 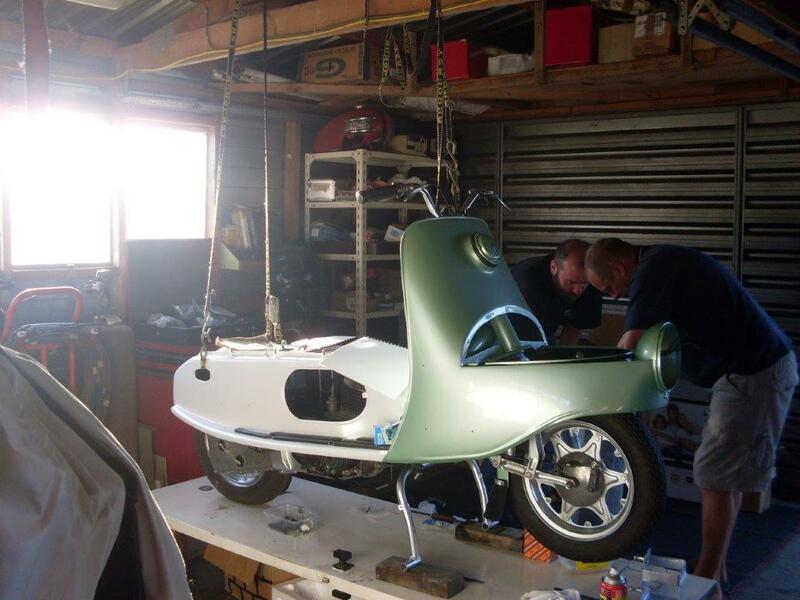 Progress with the 501 has been slow but things are starting to take shape. 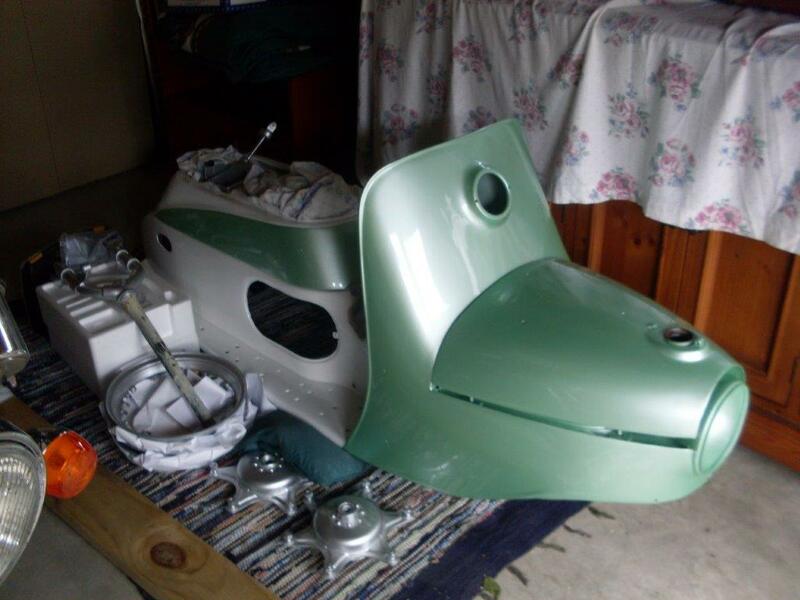 I’m doing a dry run to see what bits I still need to get for it before getting it painted. 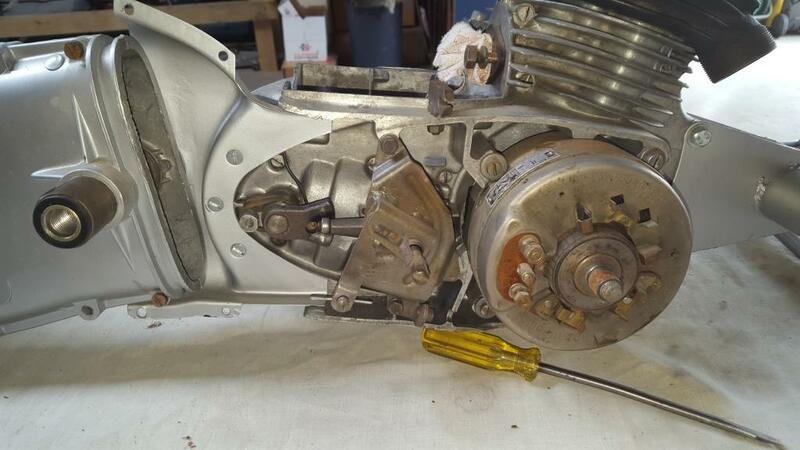 The donor bike still has a few parts left on it and I’m using the wiring as a guide.